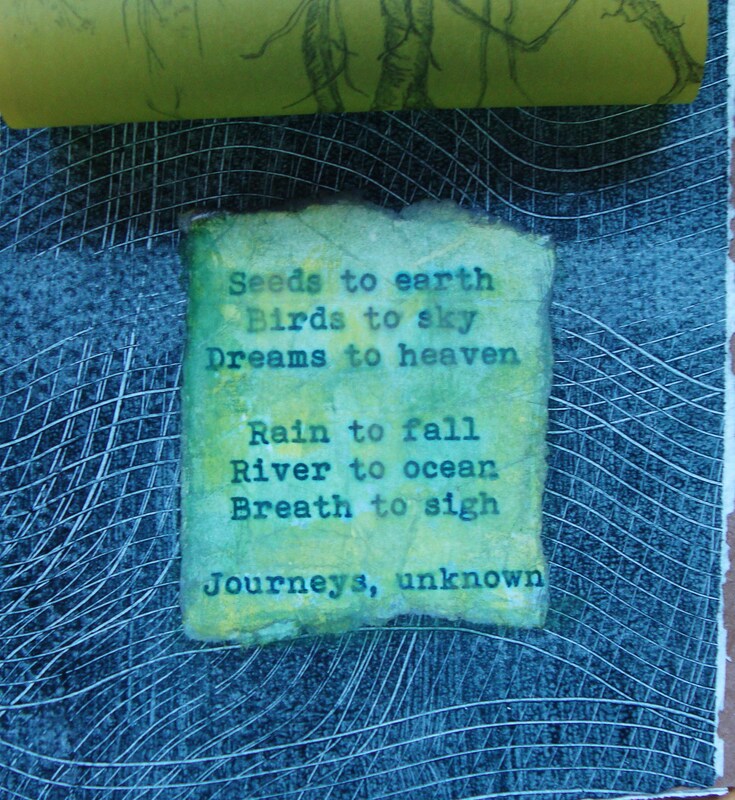 I have finally finished my little handmade recycled book. 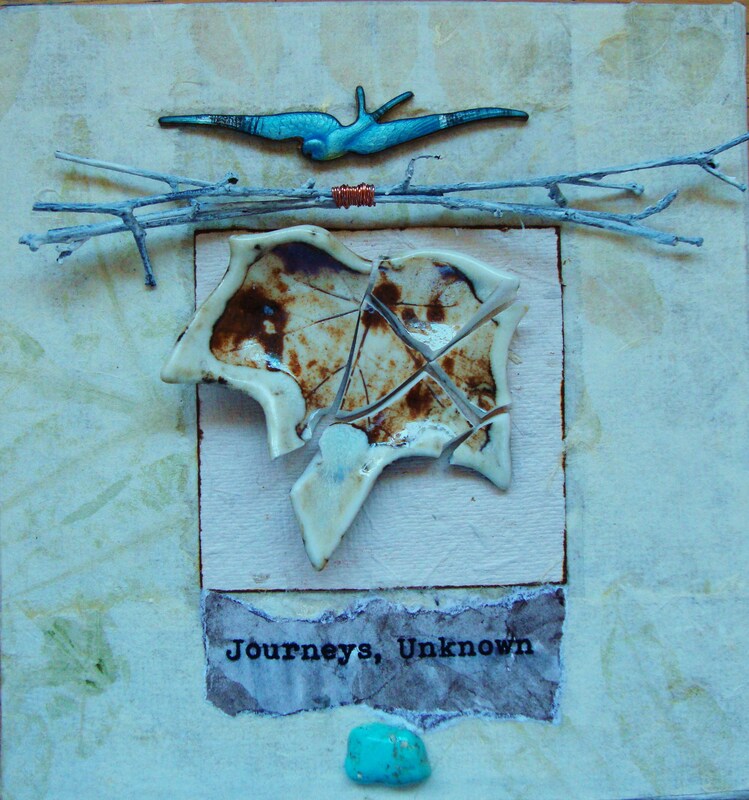 I’ve called it “Journeys, Unknown.” I used a cardboard box for most of the structure of this book. I cut the box into smaller pieces and soaked those pieces in water and removed the brown paper layers and smoothed them out to dry. 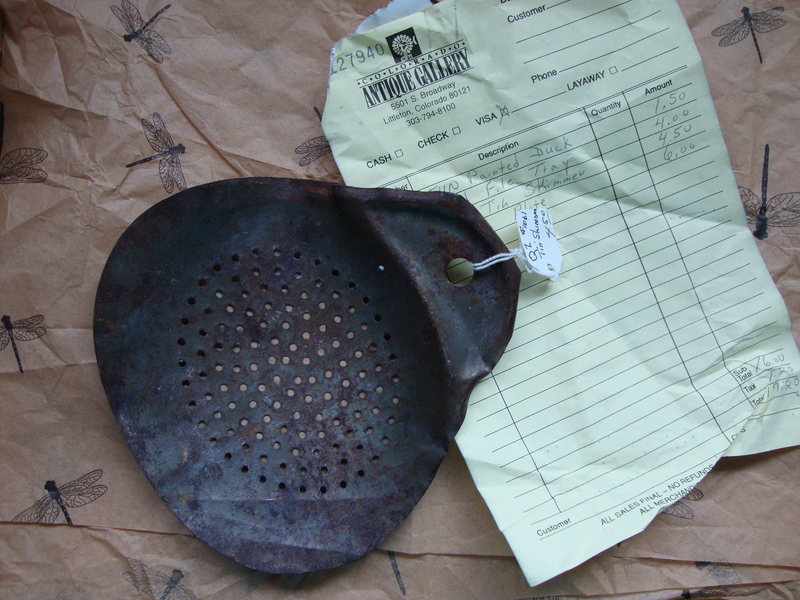 Once dry, they were very nice flat heavy weight pieces of paper. I saved them in a drawer for about a year, and then had an idea of how to use them! 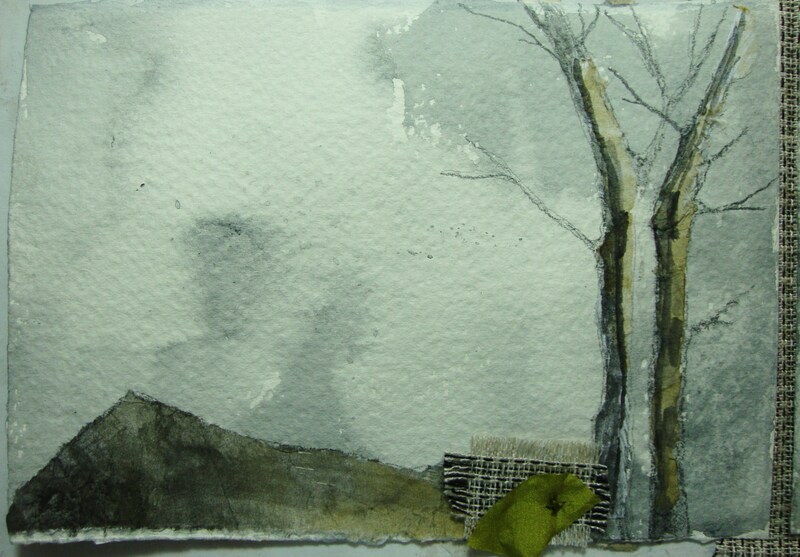 I’ve used scraps of paper left over from other projects, found objects, leaves, twigs, stones, fabric, and broken crockery. This is the cover. I made it from a piece of cardboard I cut from a box. The little broken ceramic leaf was a small dish my daughter saved for me after one of her dogs swept it from a table and it broke. She knew, as she said, that I would find a use for it! The back of the front cover. 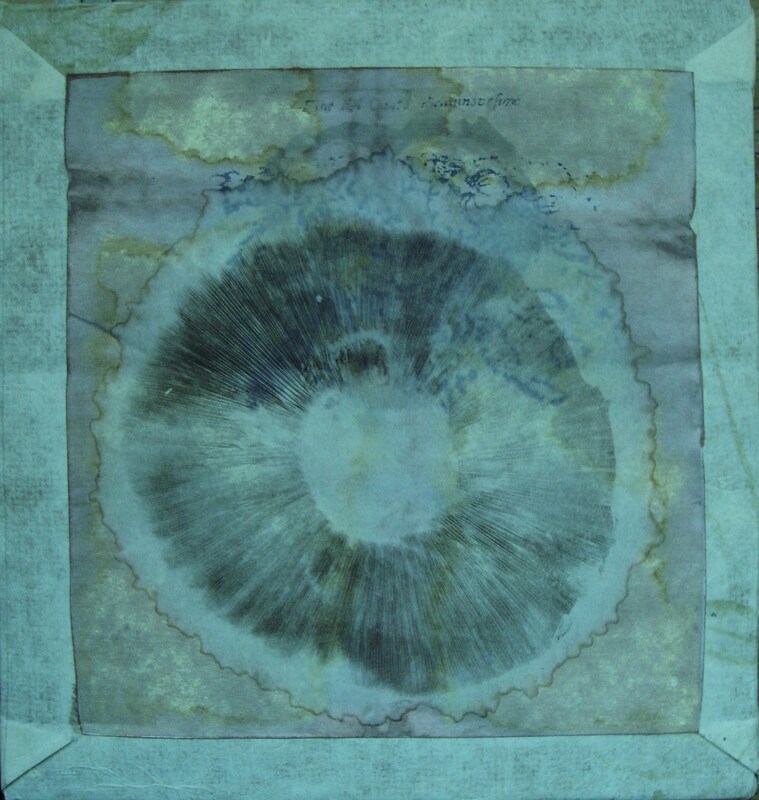 A mushroom print I made on an old book page a few years ago one hot summer when I lived in Bend. Another daughter and I went to the grocery and bought some large mushrooms and put them on pieces of paper, caps down, and left them for a few days. This was the resulting print! My computer is not processing the colors correctly, but you get the idea! Page 1 – I shared this previously. 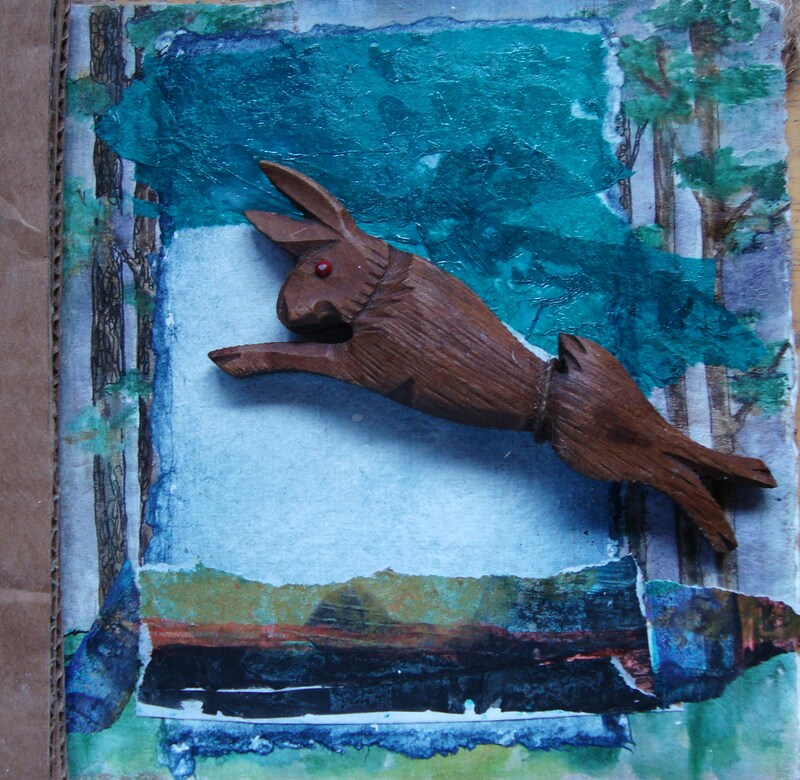 A little carved rabbit, probably from some cuckoo clock I think. Page 3 A. 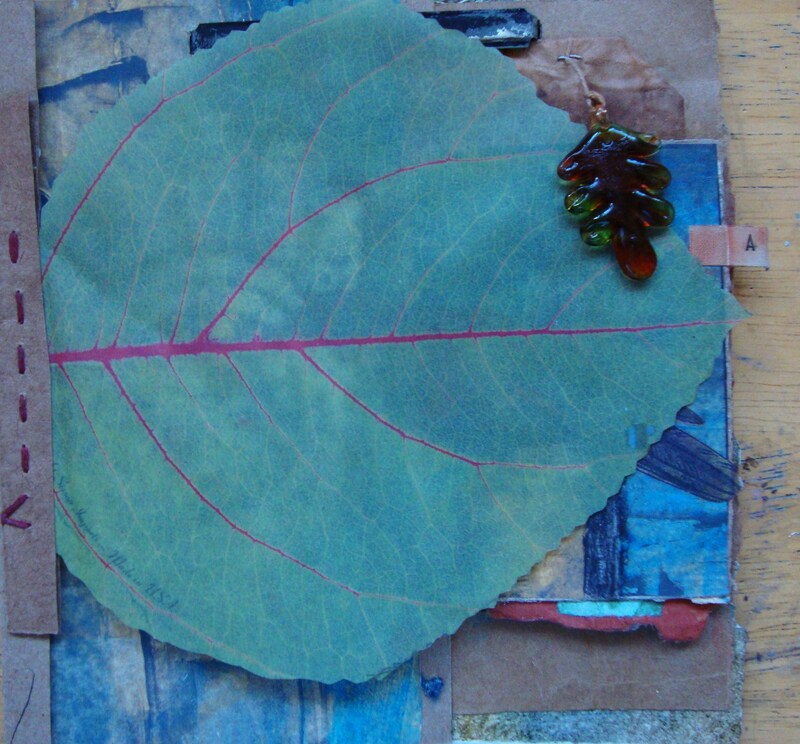 A leaf I saved from my garden several summer’s ago. I save them in a big book of Shakespeare. This one was so thin, I tore it a little when I stuck it down. Page 3 B. 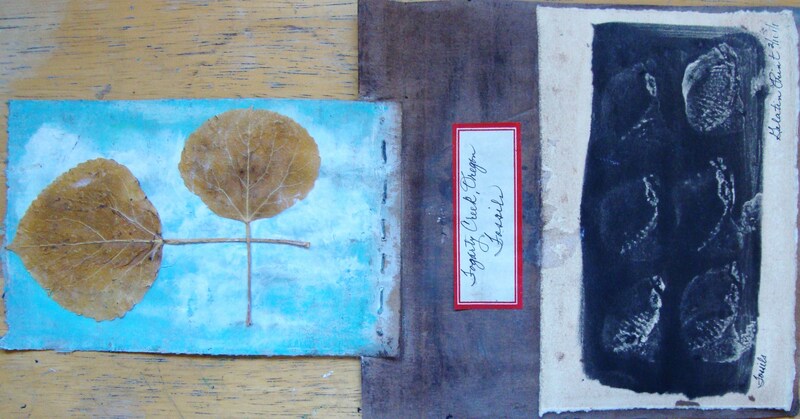 A couple of poplar leaves from Shakespeare. Page 4. 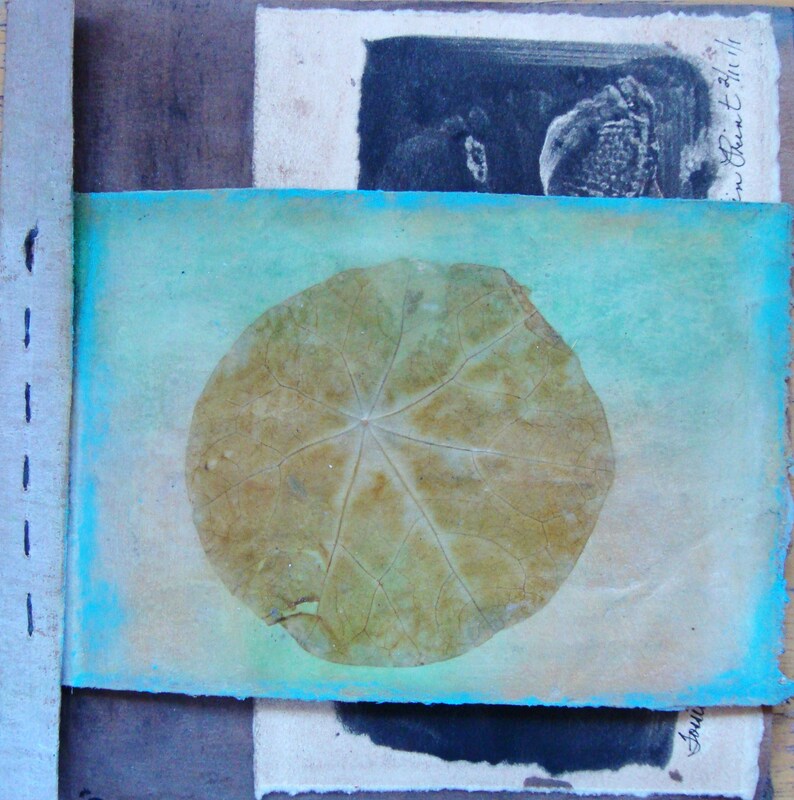 A Gelatin print I did using a fossil saved from Fogarty Creek beach in Oregon. Overlay leaf for page 6A. 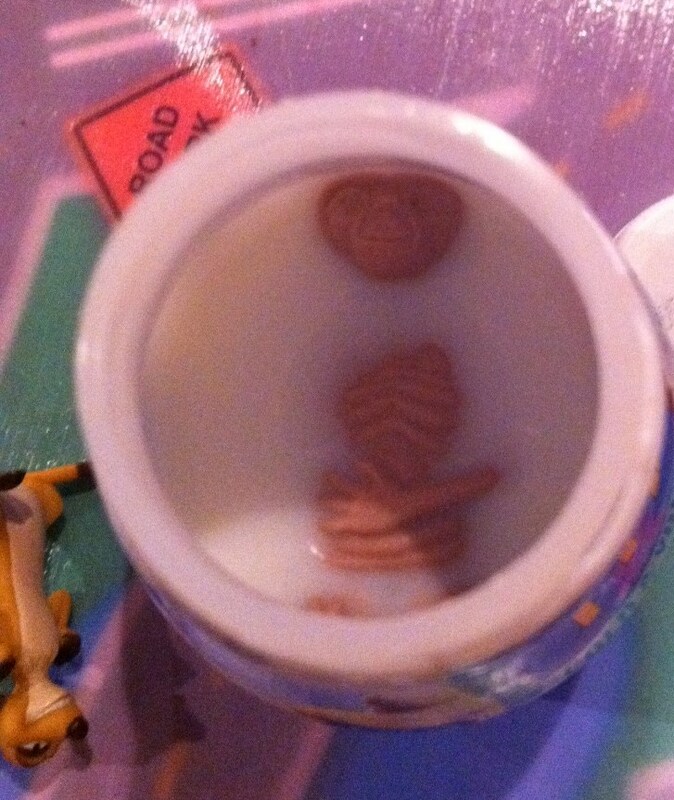 I bought these years ago at some dollar store. They were intended to us as a liner on plates for placing cheese upon. They don’t glue down very well, and they don’t take printing on – so I glued the edges into a folded piece of brown paper and will sew them through the brown paper when I bind the book. Page 6 A. A skeleton leaf my daughter sent me when I lived in Bend. My daughters are always saving small things for me to use in my art. The leaf is so delicate its like a fragment of lace. Pages 6 B Water over stones. Page 8. 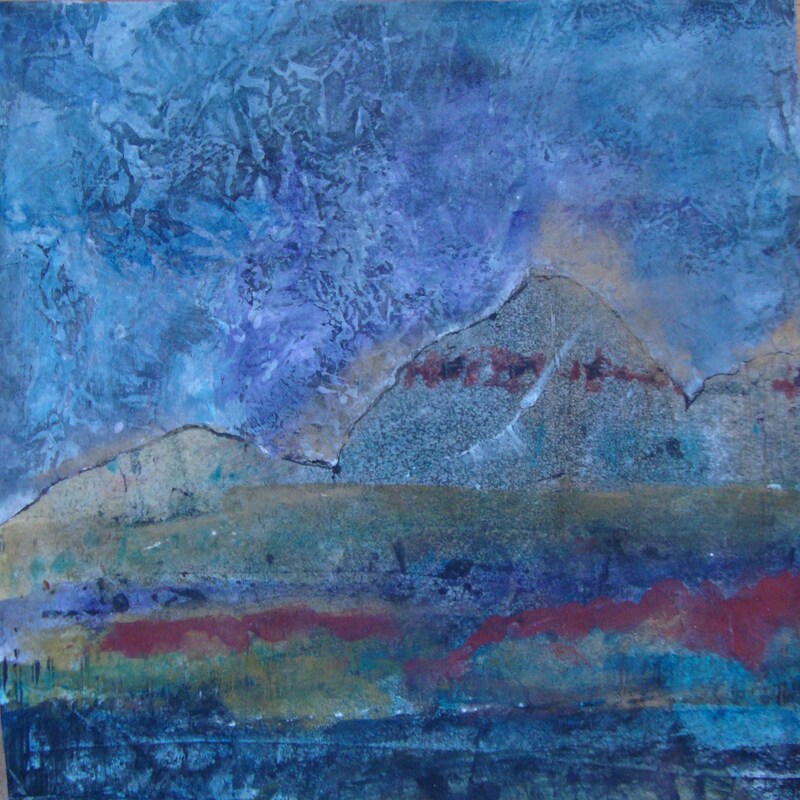 Some scraps from leftover painted paper edges, torn into mountains, sky and foreground. Page 10 and page 11. 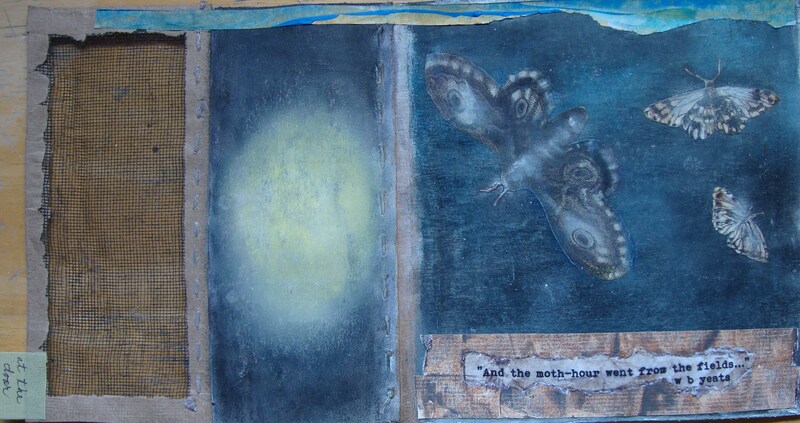 “And the moth-hour went from the fields…” w b yeats. Page 12. 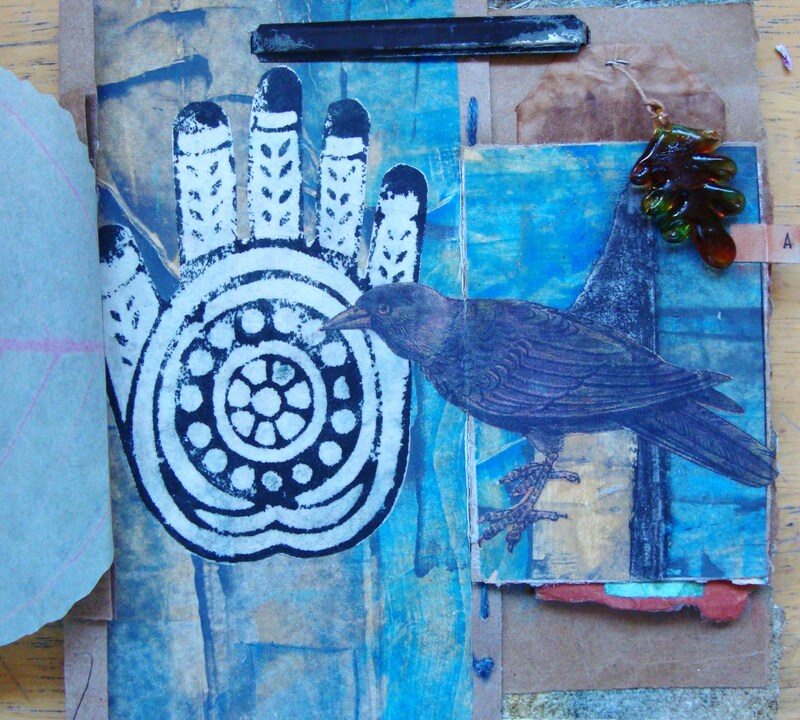 Seed pods and birds traveling on their unknown journeys. 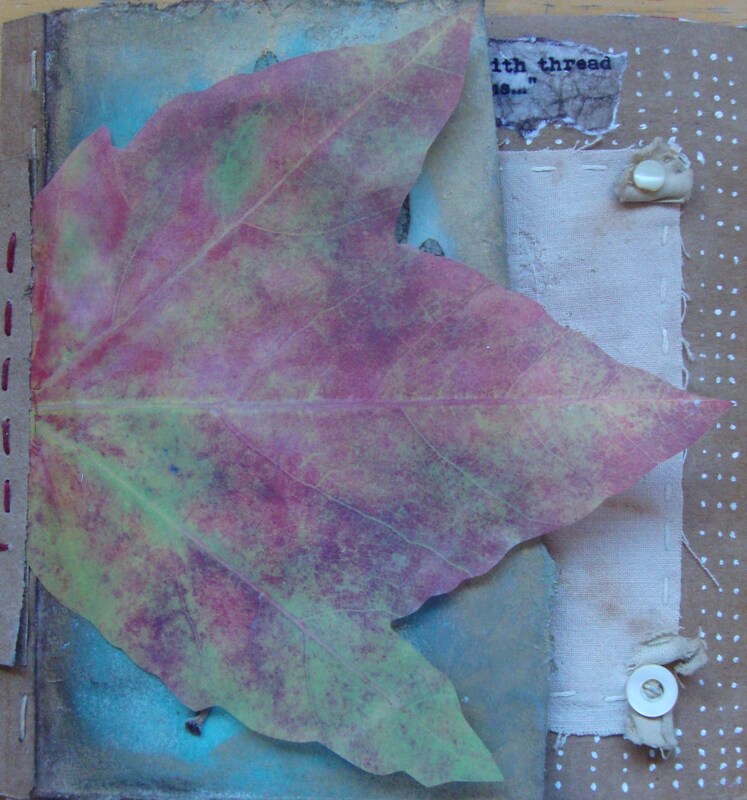 Another leaf overlay covers page 13. Page 13 and page 14 A. Page 15. 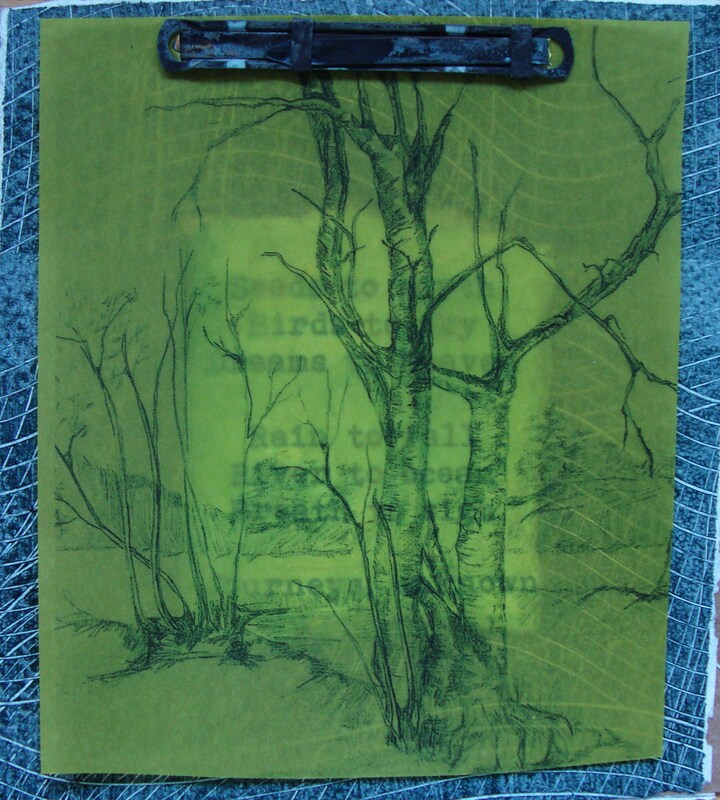 A copy of an old sketch I did and printed onto a piece of bright green vellum. Page 16. These small journeys we travel without knowing where they may lead us; these journeys that connect us to one another, and to the greater mystery of nature. 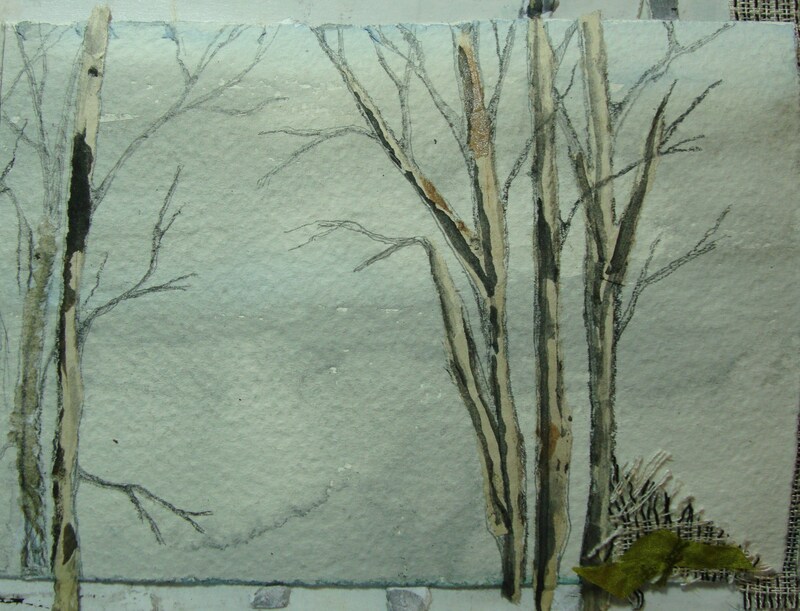 “Winter, Sky, Trees, Moss” 7×5 inches 8 pages. 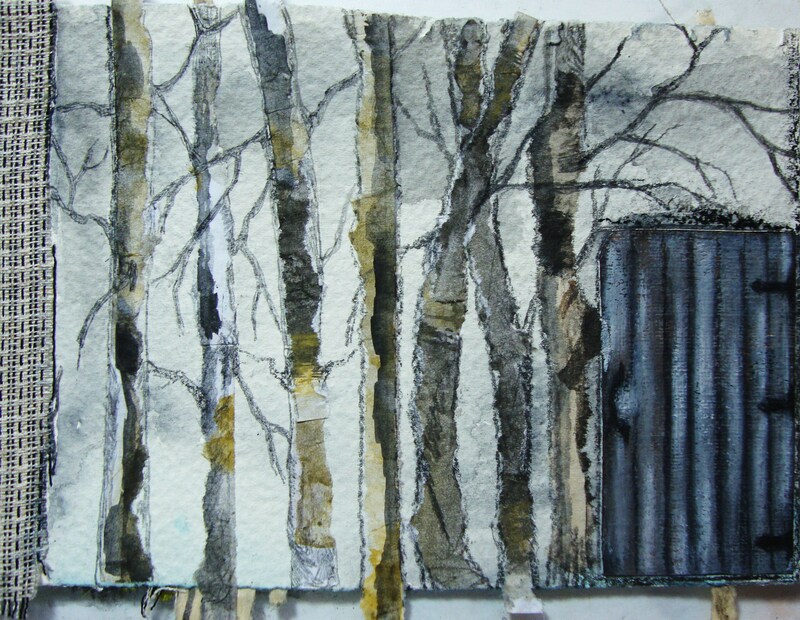 Watercolor, collage, graphite, textile, paste paper. 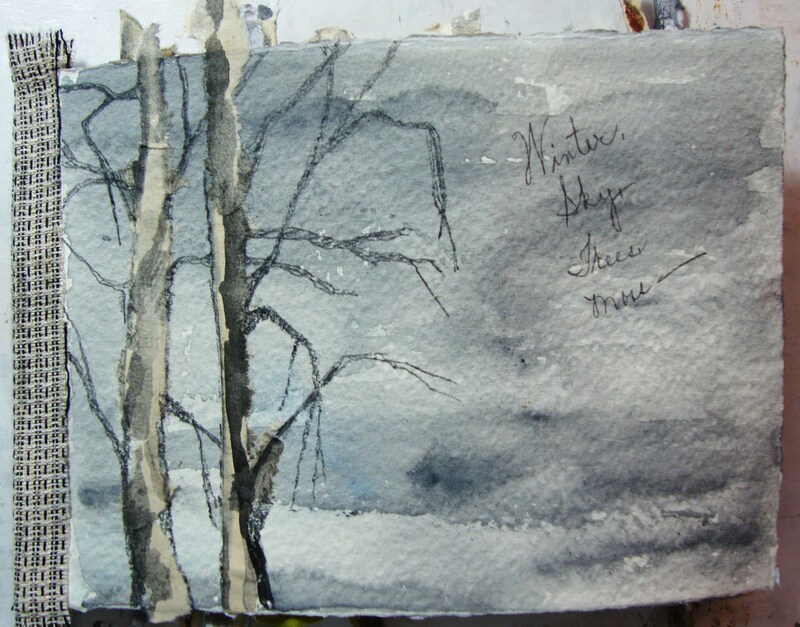 In Portland, winter can be mostly gray, and doesn’t change much from day to day. It was supposed to be dry today with a predicted weak sun, but when I woke up this morning I could hear the rain on the street as cars went rolling down the road. So another gray day. 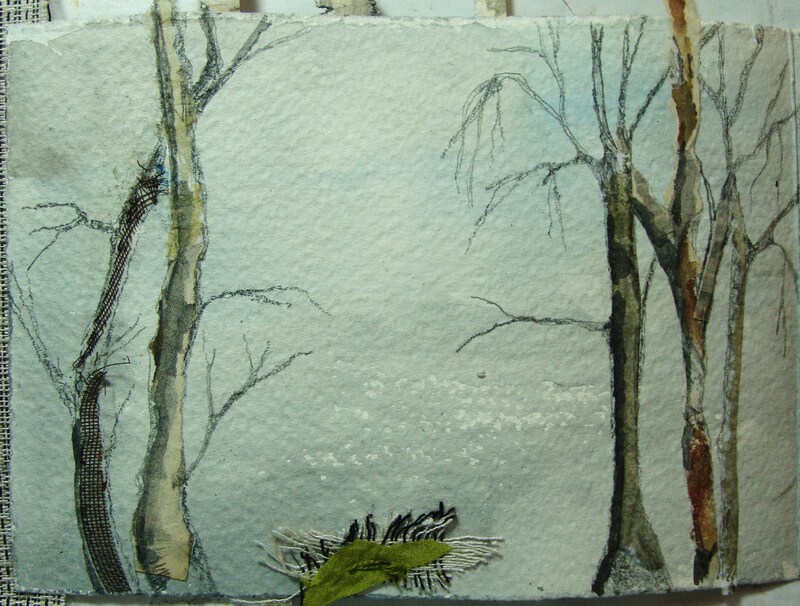 But standing outside later, I saw such beauty in the drape of bare tree branches, and gray sky, and here and there the brightest little green tufts of moss, clinging to rocks, and the concrete stairs leading up to the street. I love those little tufts of tenacity; clinging patiently through the dry times, coming carefully back to brilliant color in the rain of winter. 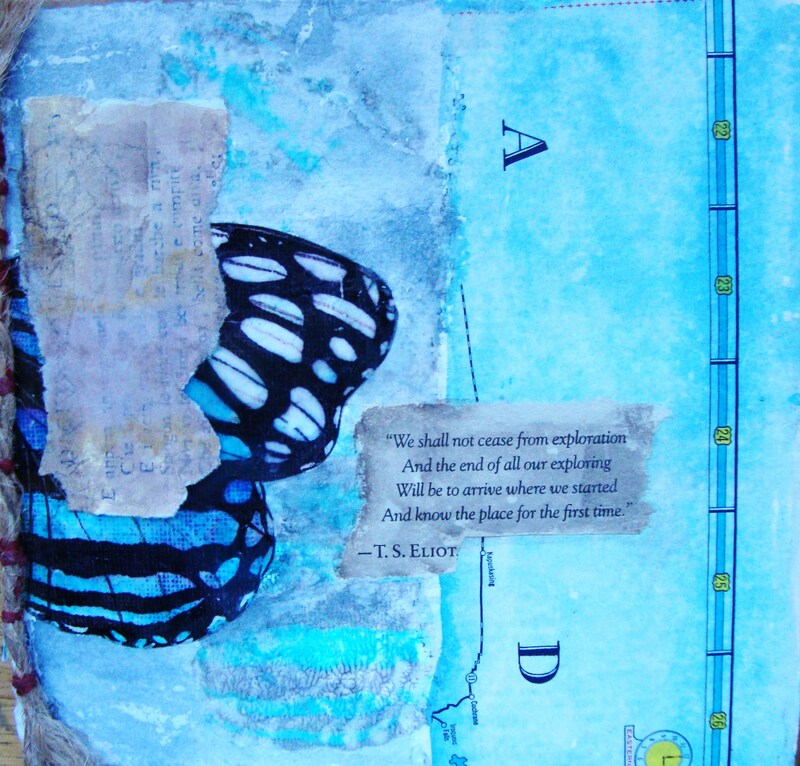 The artist’s book completed! 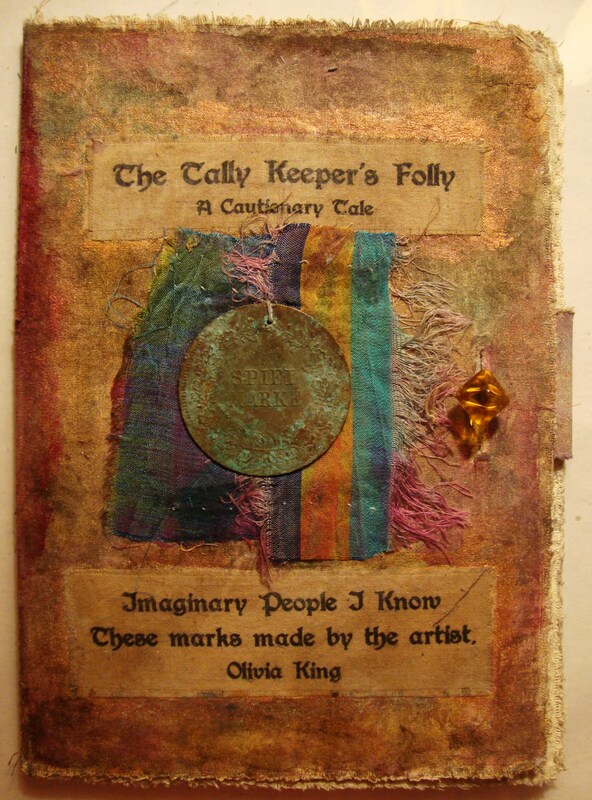 The Tally Keeper’s Folly – Imaginary People I Know -Will be on exhibit! 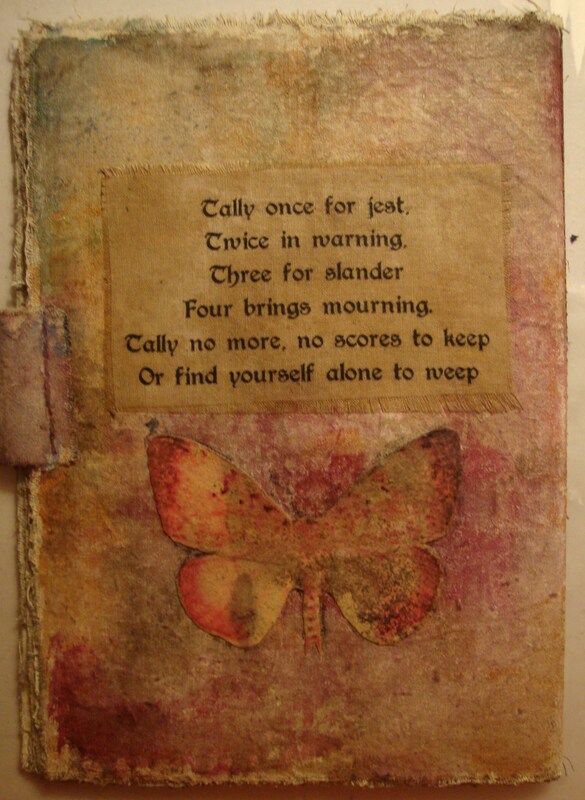 Addendum: Since I published this post about this little book,” The Tally Keeper’s Folly,” it has somehow attracted enough attention to be invited to participate in the April is National Poetry Month. 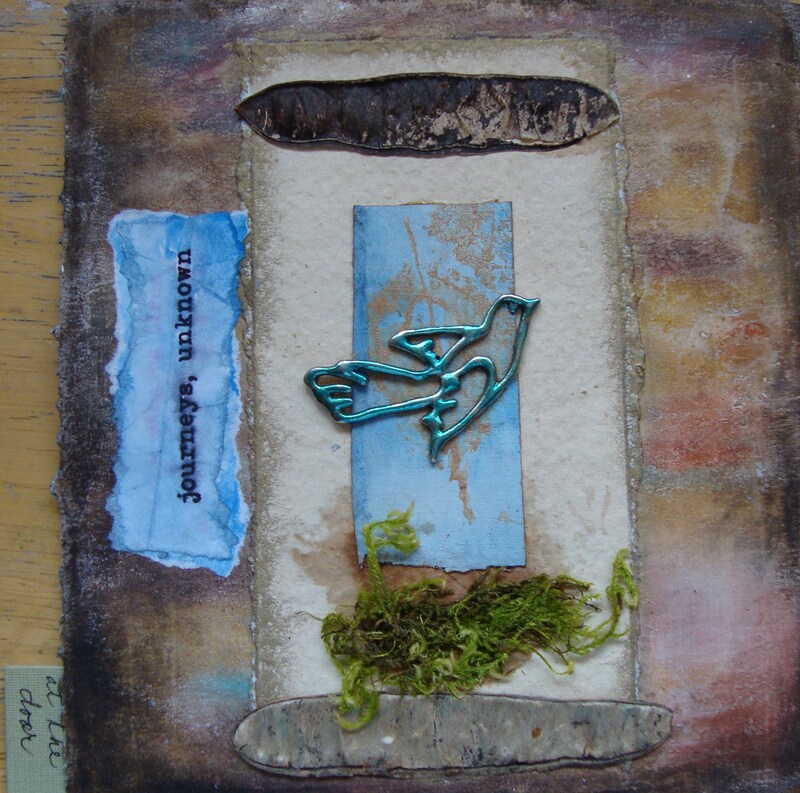 To celebrate the gift of written word and the beauty of handmade books, the Illahe Gallery in Ashland, Or. 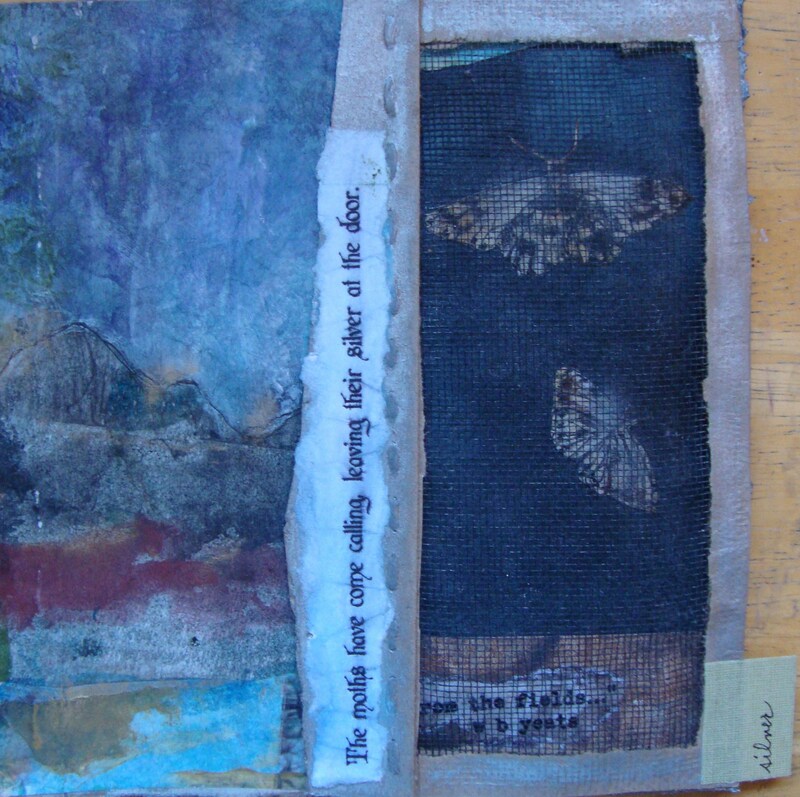 .http://illahegallery.com/exhibits/2012/february/ The Illahe Studio and Gallery is staging an exhibit of artist’s books of every size and type! “The Tally Keeper’s Folly” will be there with the best of them! April 6-28. 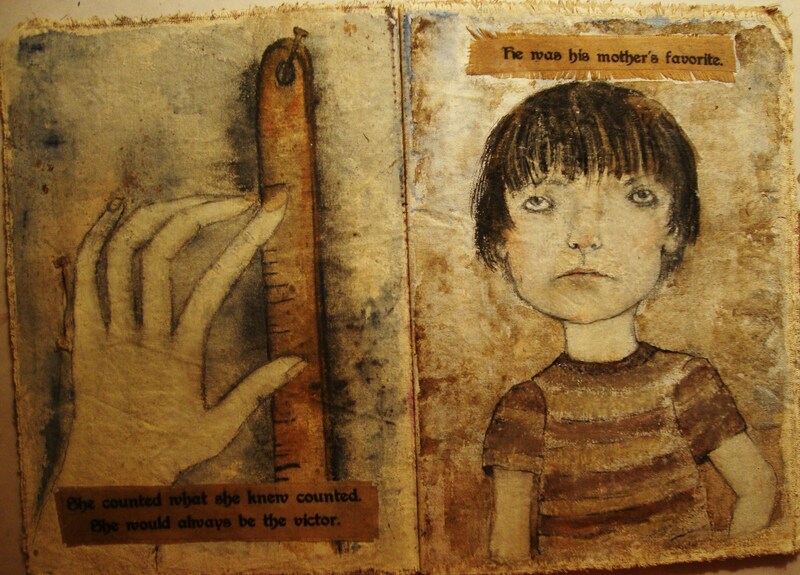 It will be a wonderful exhibit if you love handmade books. Posted Sunday February 12, 1012 at 12-midnight. Can you tell I am a little bit excited! 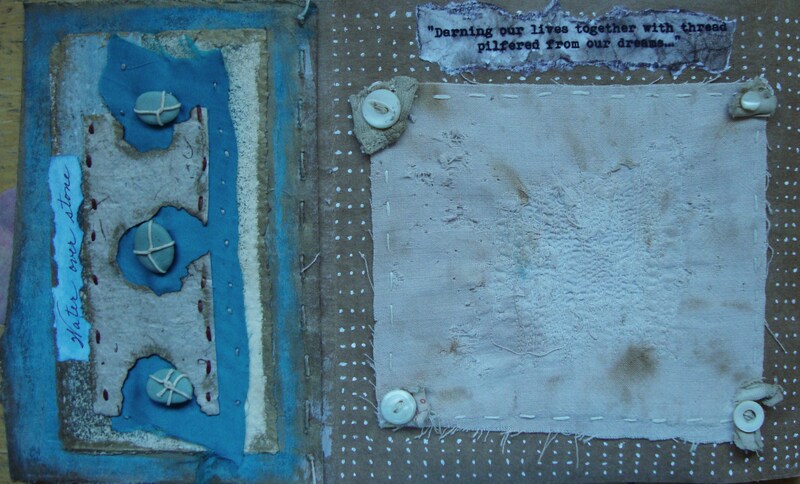 This is a handmade muslin book created by Lynne Hoppe, http://lynnehoppe.blogspot.com/ which I won in a give-a-way. I’ve been saving the book for a couple of years. I started doing some drawings in it, and saw a loose storyline form. 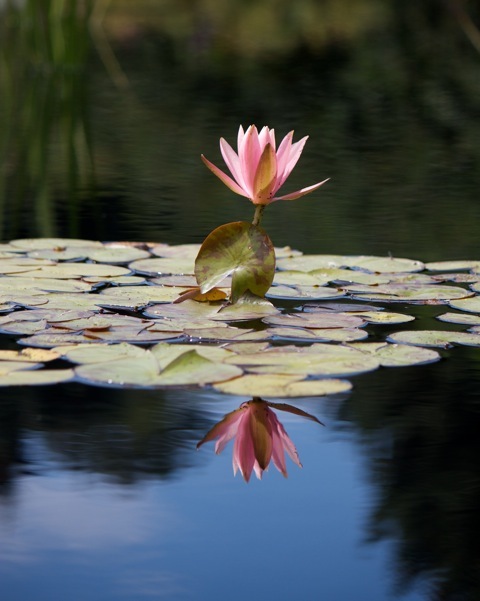 I have been thinking lately about people who have a very strong need to “keep score” or count up all the “wrong” things people have done, but never think much of all the good things people do every day. So this little book turned into a story about a woman who was driven to keep her scores of every slight, real or imagined, until it began to destroy her life. She is visited in the end by two strange figures who tell her of the mistake she is making by counting sorrows instead of joys. In my version she believes them and changes her ways! I decided to use another time era ambience for this book, thinking of medieval times when people counted their debts on tally sticks where they would make a mark on the stick for each debt owed, and the size of the mark often had bearing on the size of the debt. 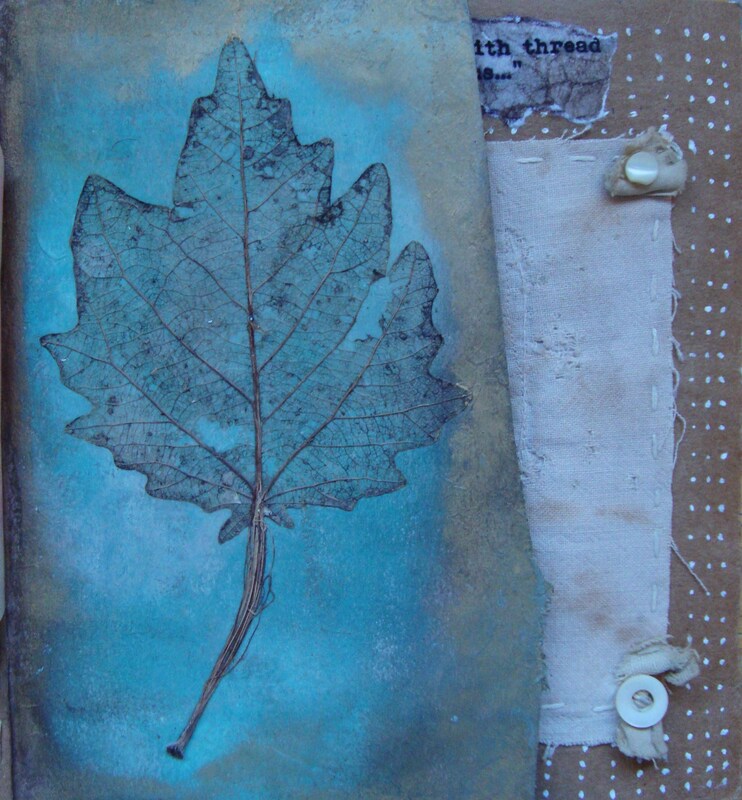 The words in the book were printed directly to the coffee dyed muslin with an inkjet printer. 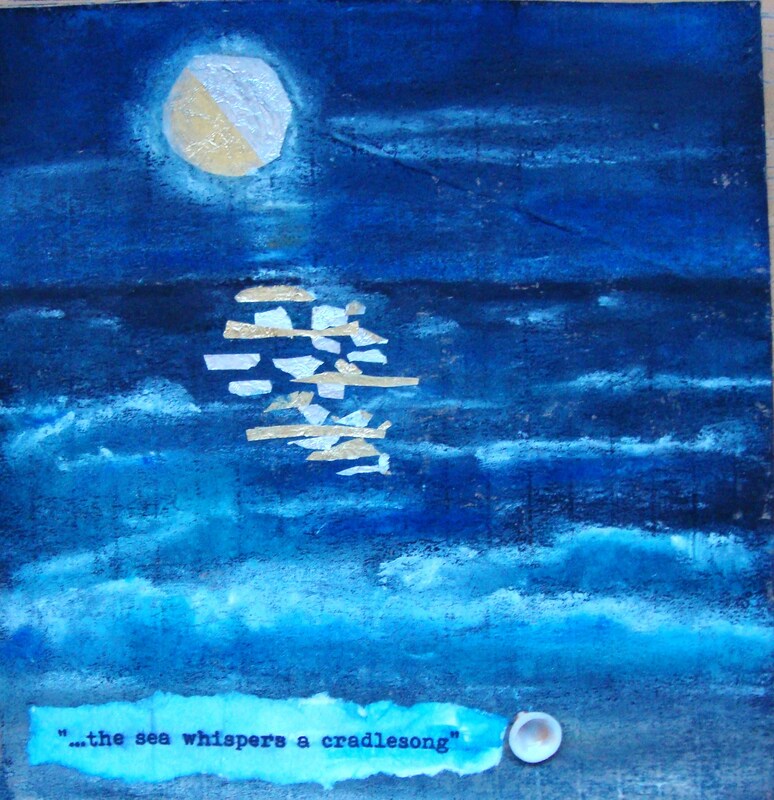 I ironed 8.5 x 11 pieces of muslin onto freezer paper then I cut each quotation apart with scissors and used a straight pin to pull threads from the edges – then I just glued them down with matte polymer medium (I used Liquitex). I think sewing them in would have been really perfect, but I would have had to sew through the illustrations on the other side of the page, and it just wouldn’t have worked, so I glued them in. 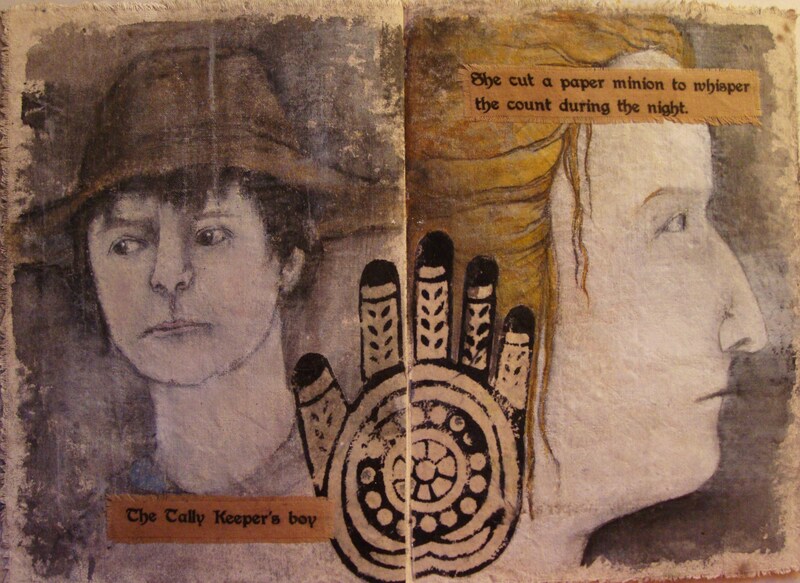 Pages 1 and 2 – The Tally Keeper is looking at marks on a stick while her favored child observes. 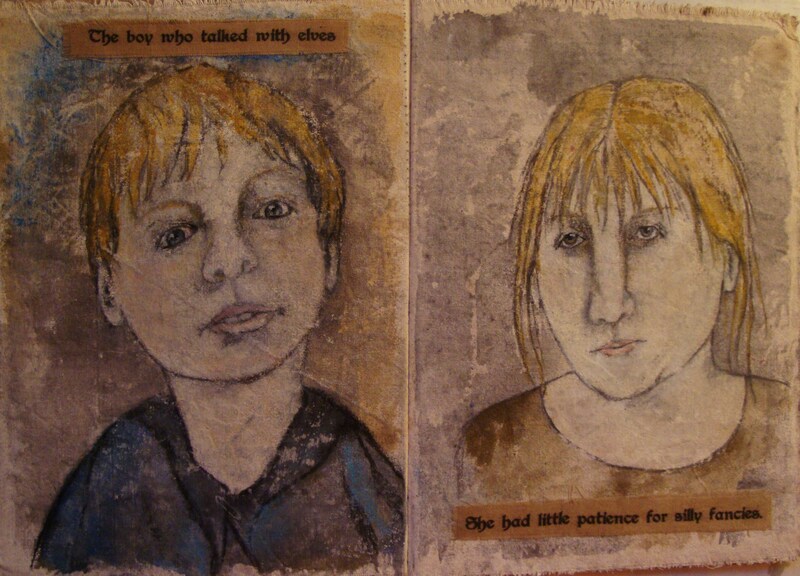 Pages 3 and 4 – Portraits of her other children. A sad lost boy and his older sister, who has little to say. 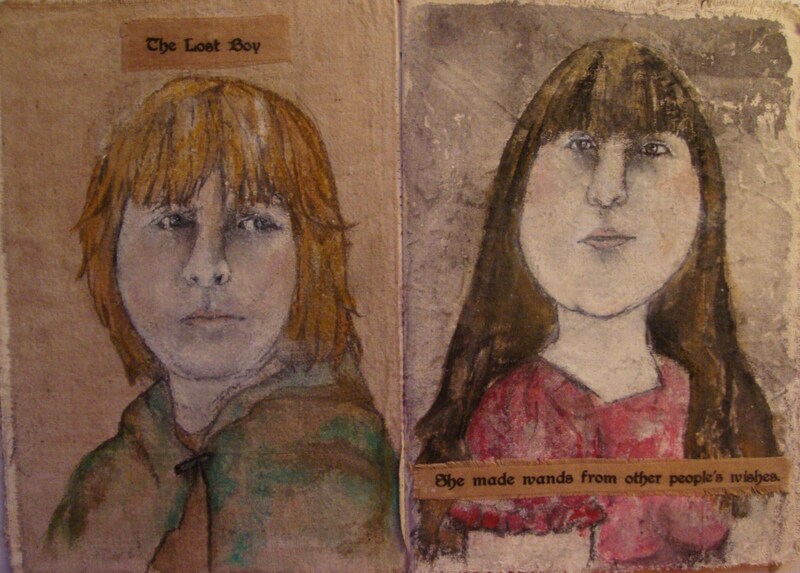 Pages 5 and 6 The Lost Boy in a younger portrait – when he believed in magic. The Tally Keeper with little time for him. Pages 7 and 8 – A study of The Tally Keeper’s jumbled dreams. 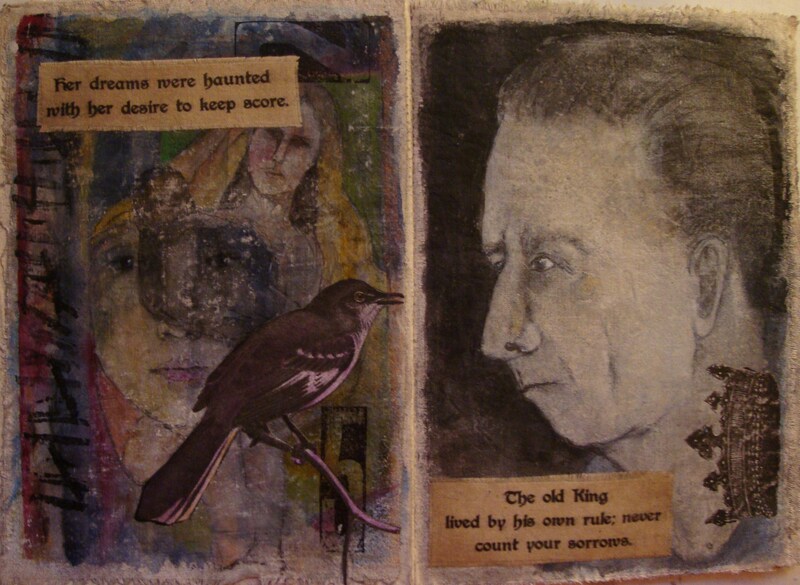 The Old King who never kept a count of sorrows. 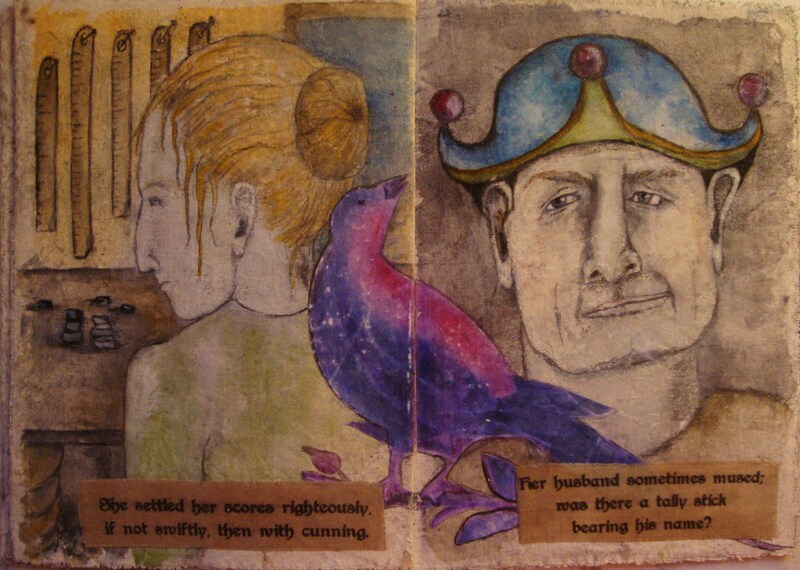 Pages 9 and 10 – Her favored son again, still watchful, older now. She cut a paper minion – I just wanted to use the word minion! 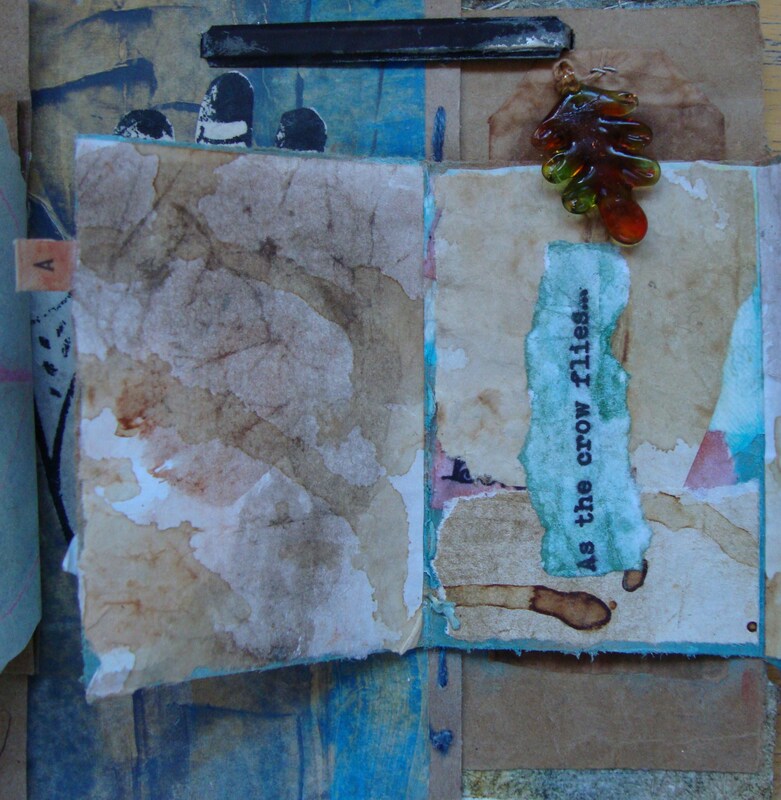 Pages 11 and 12 – She continues to count her scores, and keep tally of all her woes. Her husband begins to wonder if maybe his name is on a tally stick too? 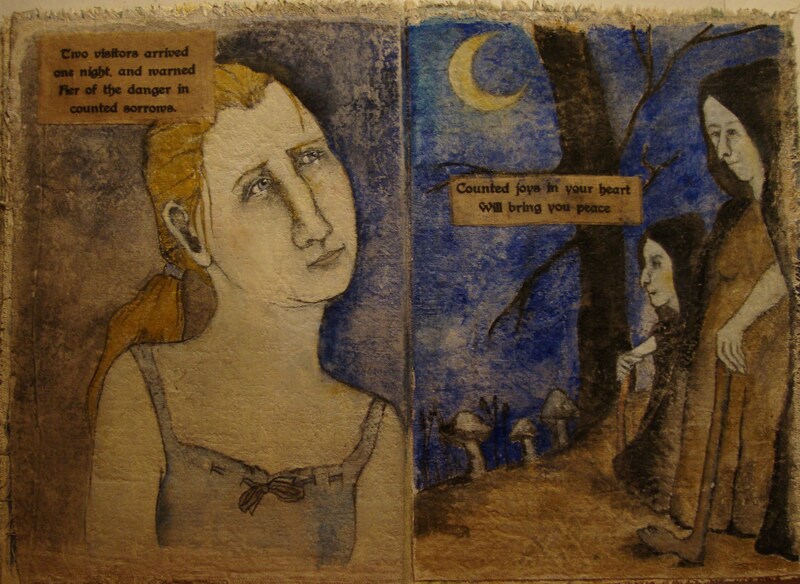 Pages 13 and 14 – Two strange old women come to visit her one night to help her see the error of her ways, after a few tears she agrees to change. 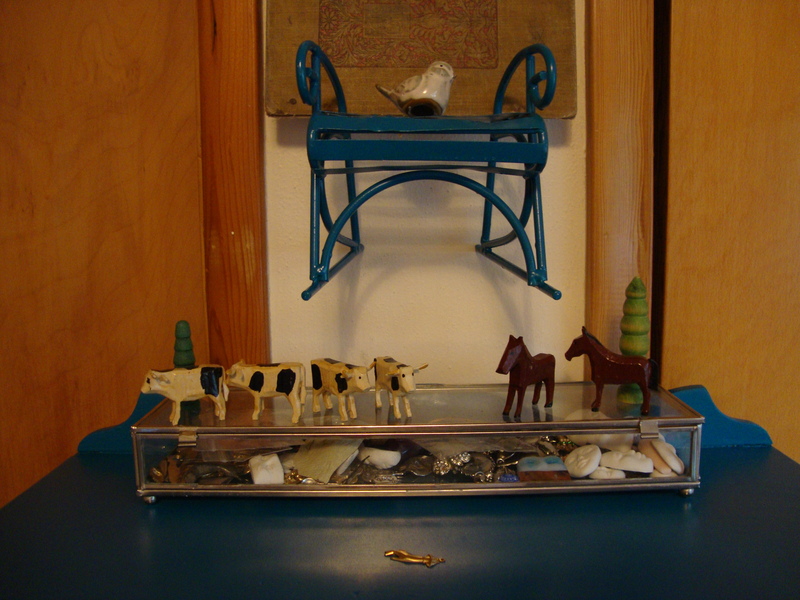 Top of the bookcase a few hand carved farm animals from (eastern) Germany, standing on a glass box of trinkets. 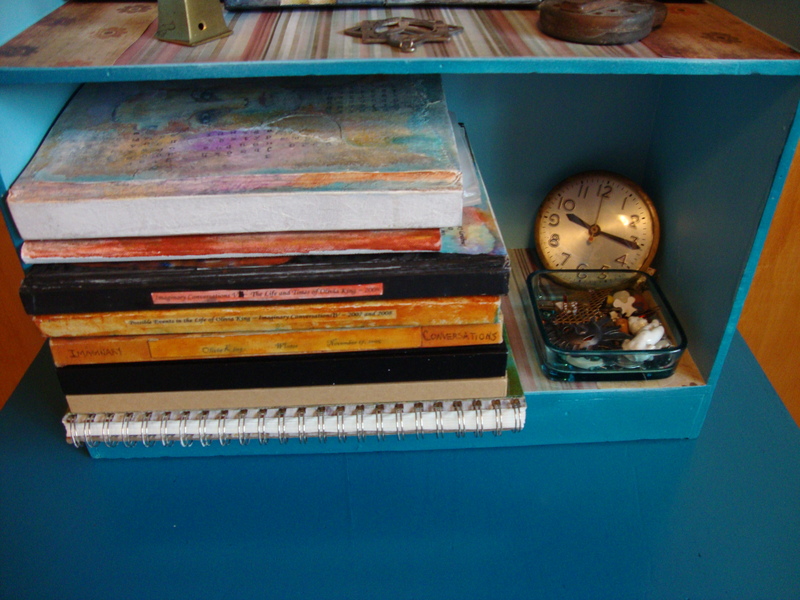 First shelf with smaller journals, and a few vintage ink pens. 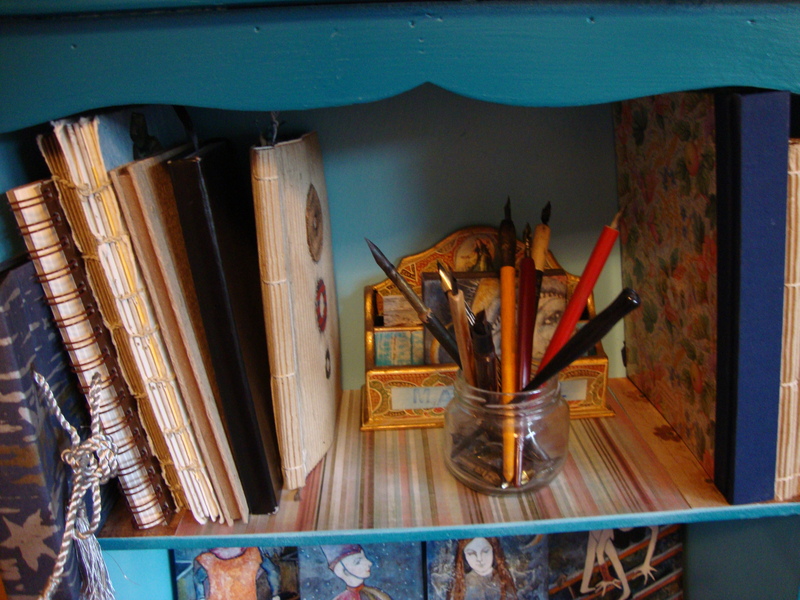 Second shelf with some small paintings, which will probably be removed to make space for more journals! 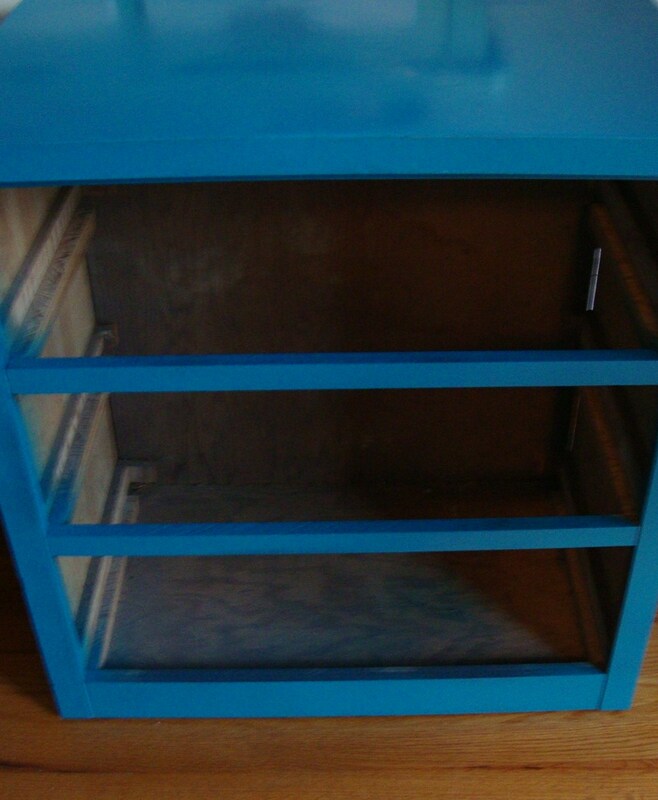 Bottom shelf with stacked journals too tall to stand up right. 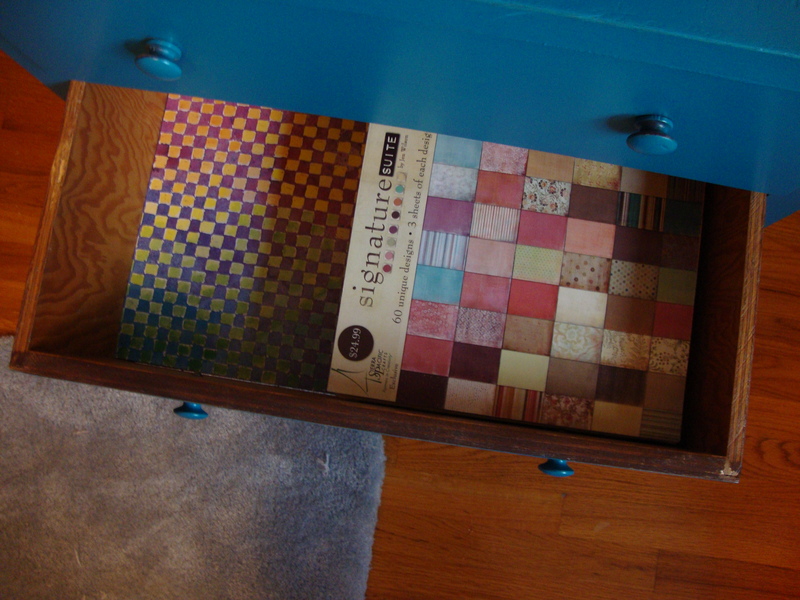 Open top drawer – nice and neat and room for more! 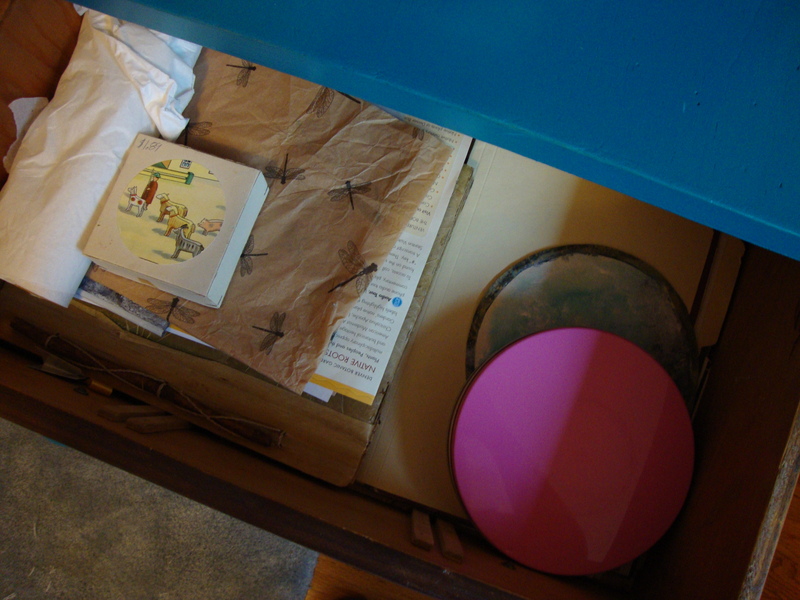 Open second drawer – paper stack – room for more! 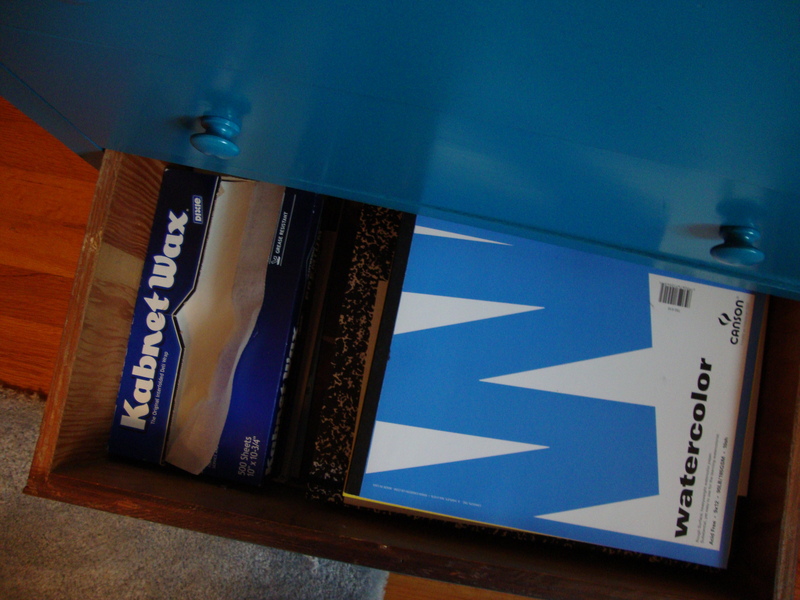 Bottom drawer – filled – but I know where all the sketch books and blank paper is now! My Paper Stack — Visit Seth Apter at http://thealteredpage.blogspot.com/and see why! 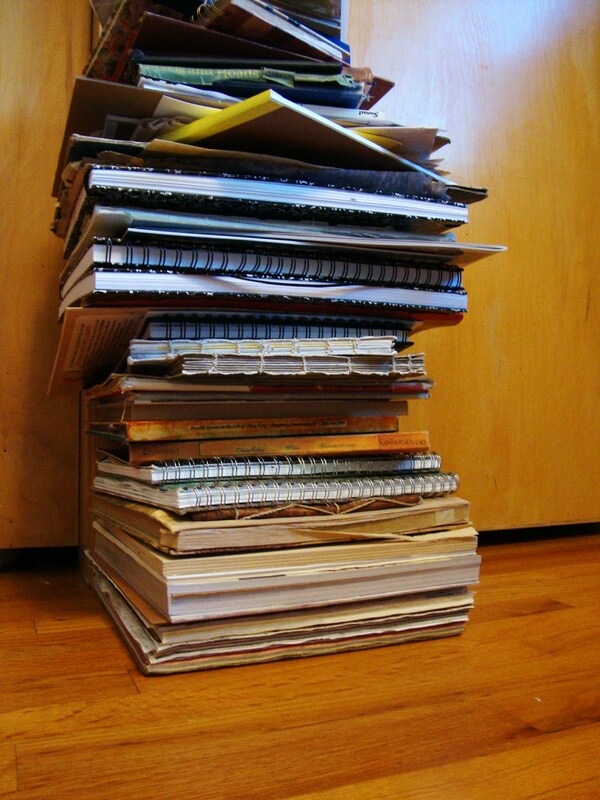 Seth Apter http://thealteredpage.blogspot.com/ had a fun idea of everyone posting a photo of their paper stack on their blog today! 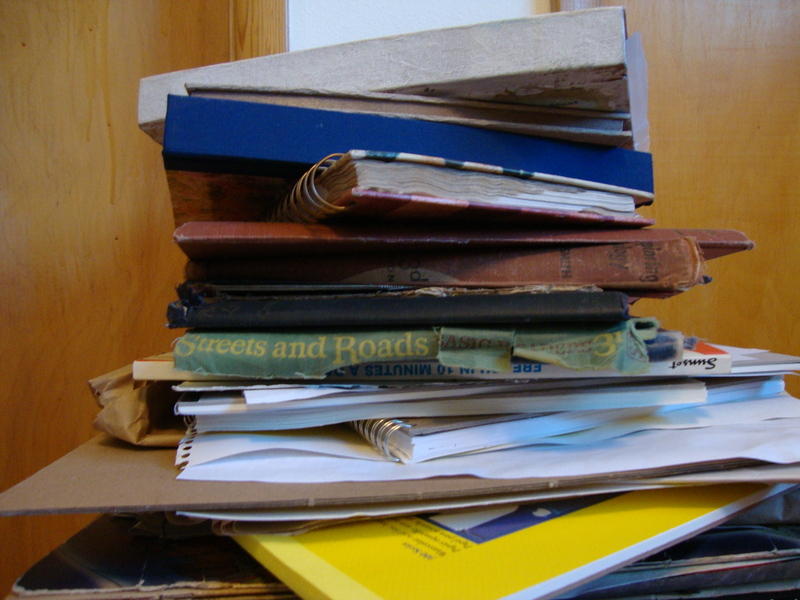 We all love paper and it isn’t easy to find places to store it all, so it sometimes stacks up! 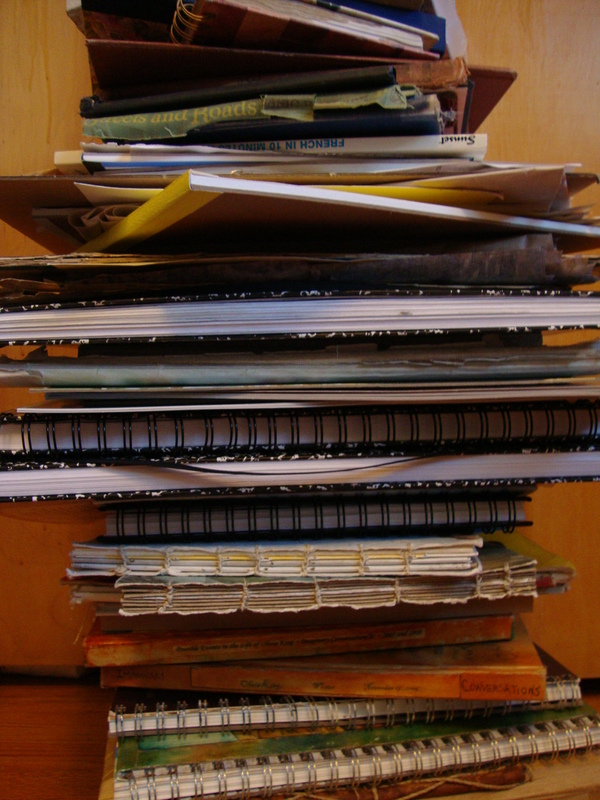 Here is my stack, which includes journals, sketch books and other paper I can’t part with. Looking at it now I think I need to find an organized system to store most of this stuff! 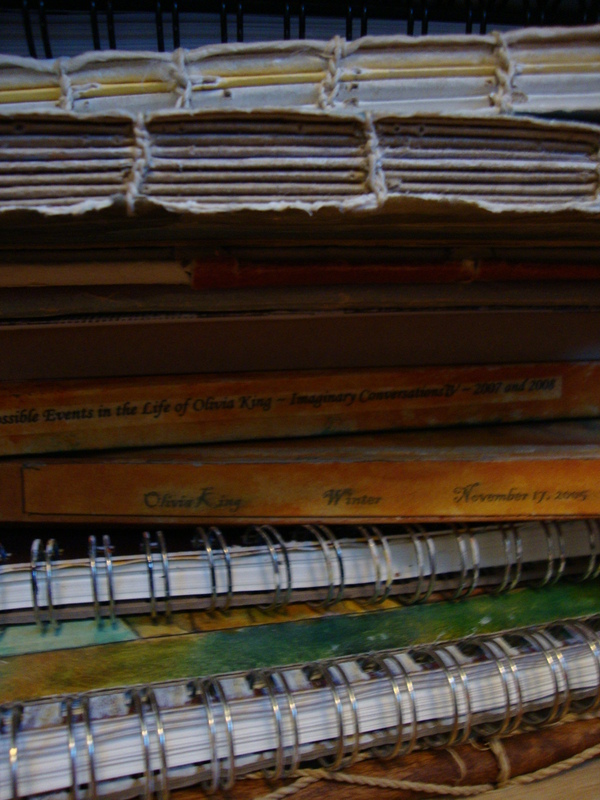 Here you can see some of the backs of journals wedged into the paper stack. 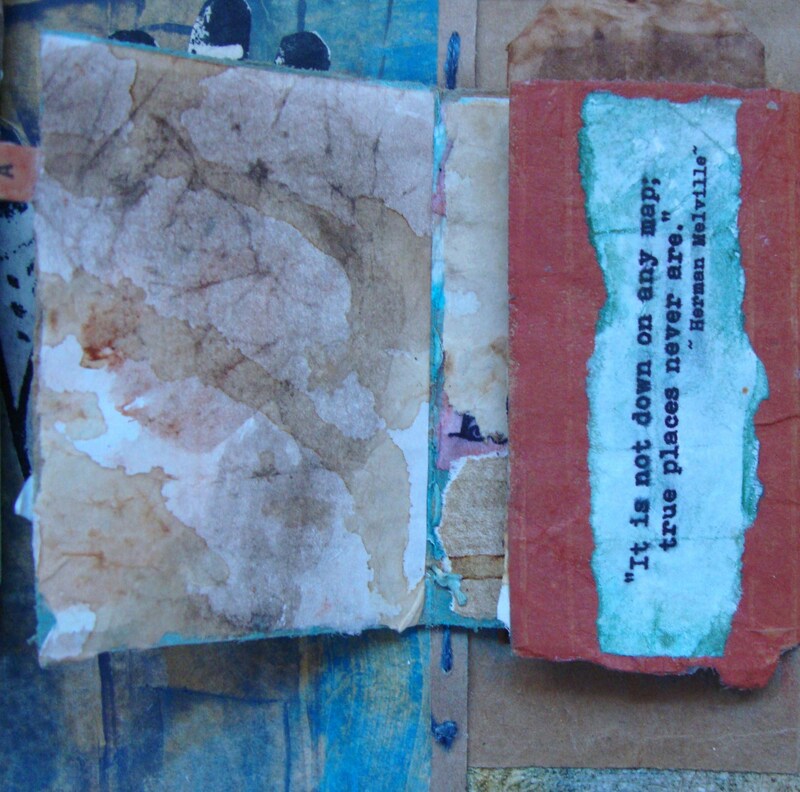 Some discarded book bindings – I do plan to use them, eventually, no, really! 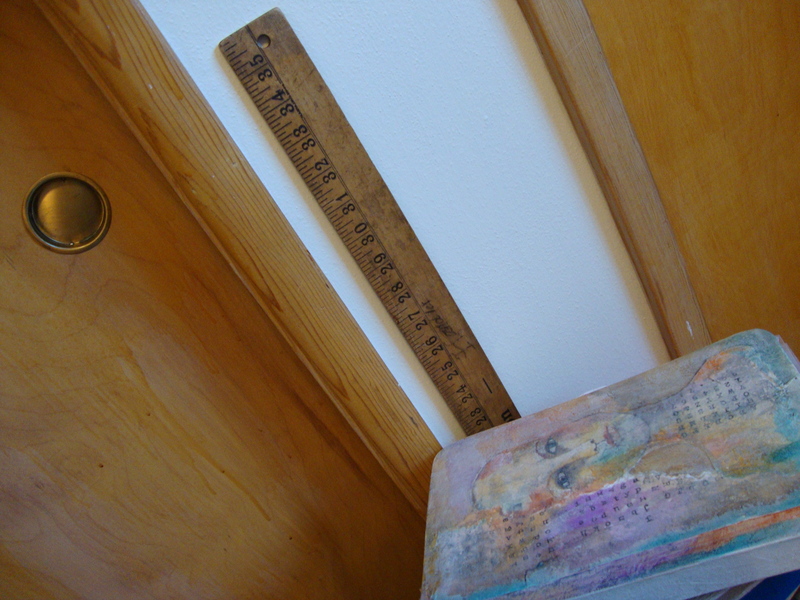 Top of the stack, current journal with yardstick in the background – measuring 23 inches tall – that’s way too much disorganization for me! 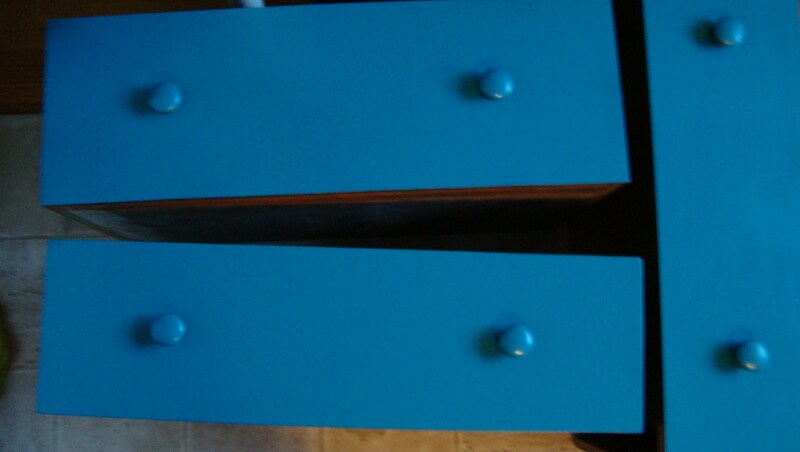 I am painting an old dresser as we speak to put this stuff, the dust bunnies love, away! 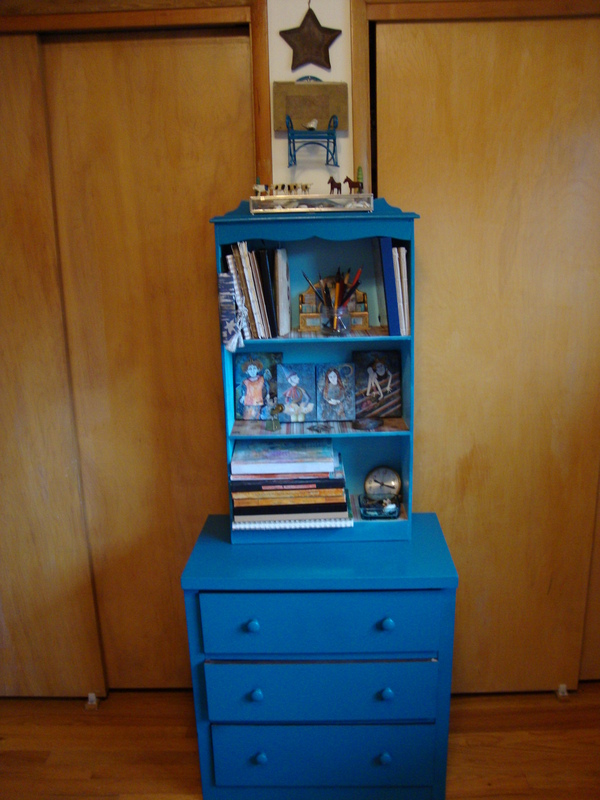 Newly painted drawers for the paper stack! ! 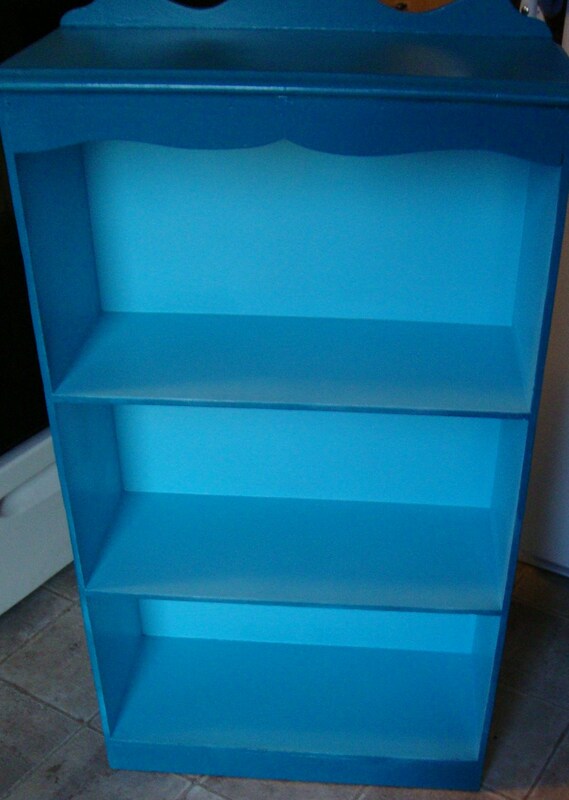 Very square and plain – but now its pretty turqoise – not as blue as it looks in the photos. 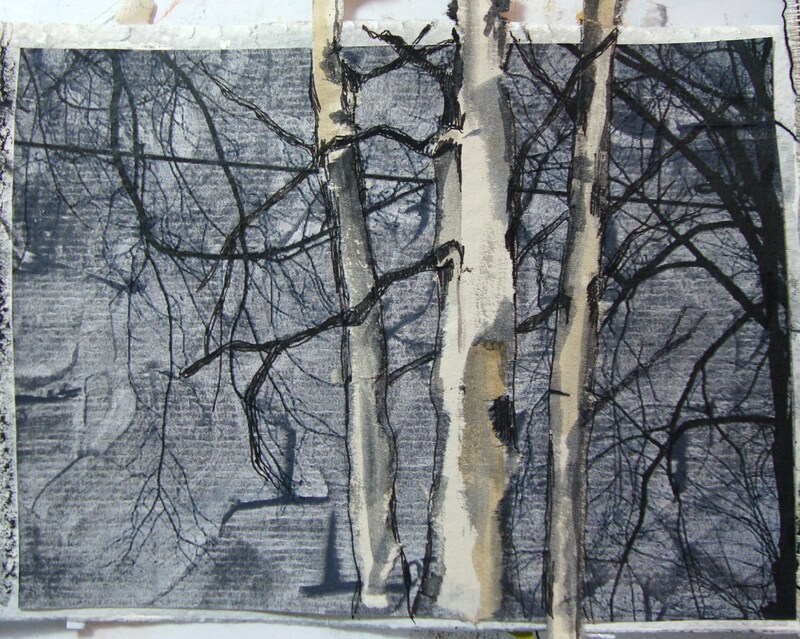 Once I started painting, I couldn’t quit! I kept looking for more things to paint. 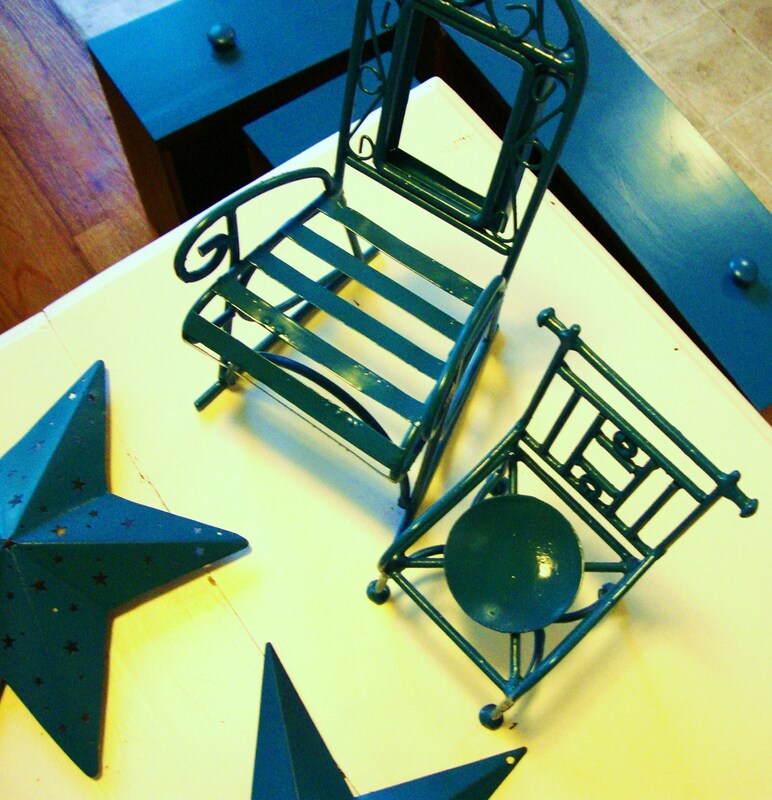 A couple of stars, a couple of chairs and..
a small thrift store bookcase to go on top of the newly painted chest! I used two colors for this piece! Lots of new storage now! 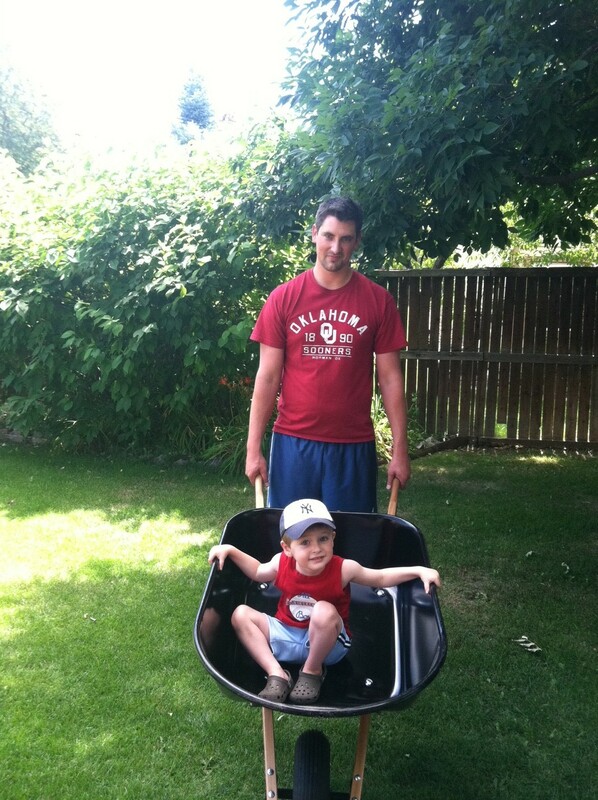 Thanks, Seth, I needed a push to get this done! 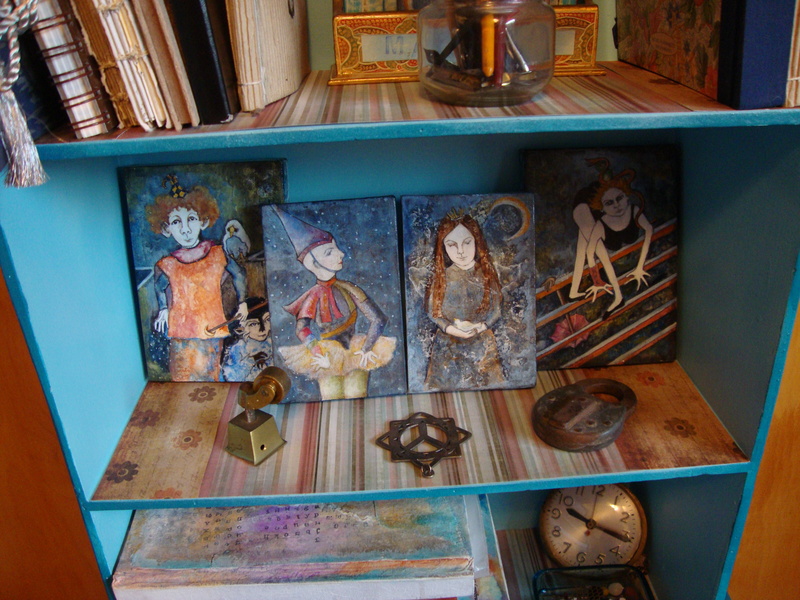 And thanks for always coming up with new ideas for us art bloggers! 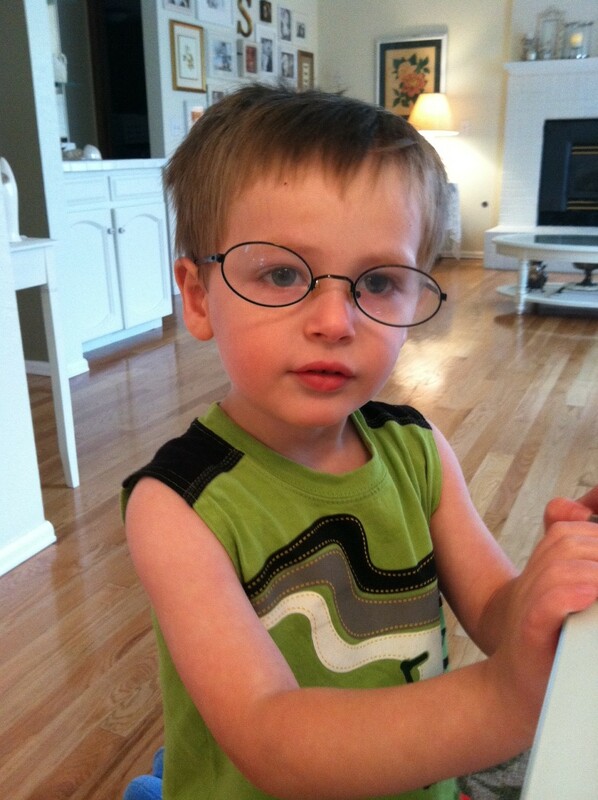 Cait and I just spent a week in Denver visiting Elizabeth and Christian, and my beautiful grandson, Cabrin. The weather was very warm, several days of 100 or more! 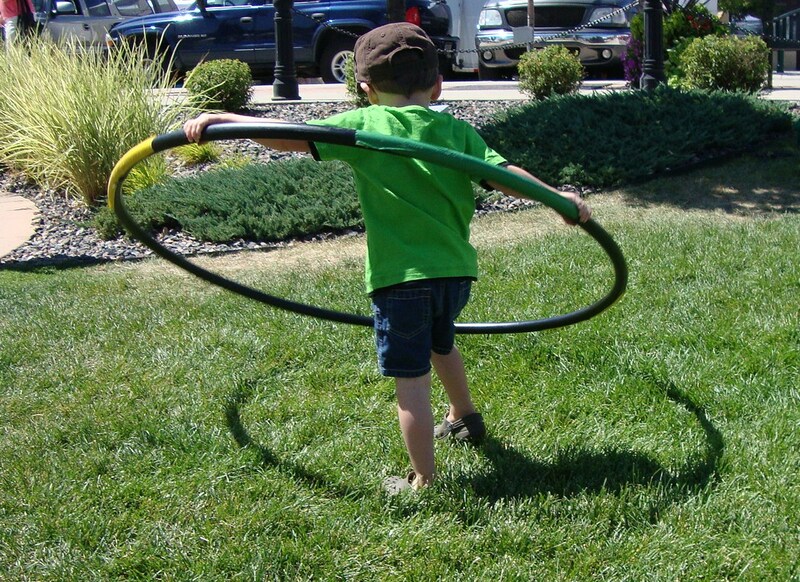 So outside time had to be managed a little, but we still found plenty to do! One hundred or more doesn’t seem as hot as 100 in Portland. Its very dry in Denver, so not much humidity. 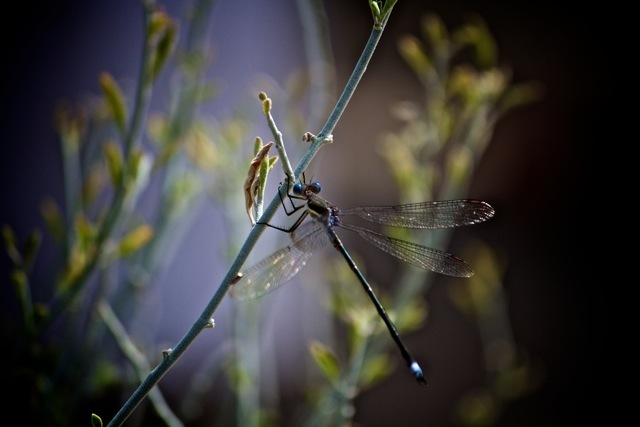 (Our week was dry and warm, no thunder storms or rain.) 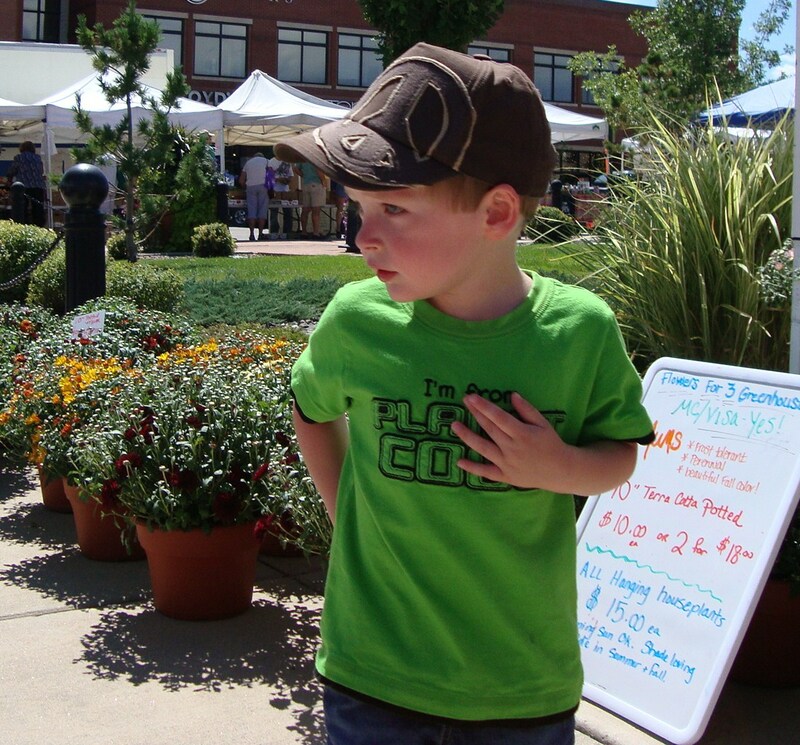 We went to markets, fairs, the aboretum, parks, creeks, antiquing, shopping, and spent hours on the deck talking and playing with Cabrin who will soon be three-years-old! 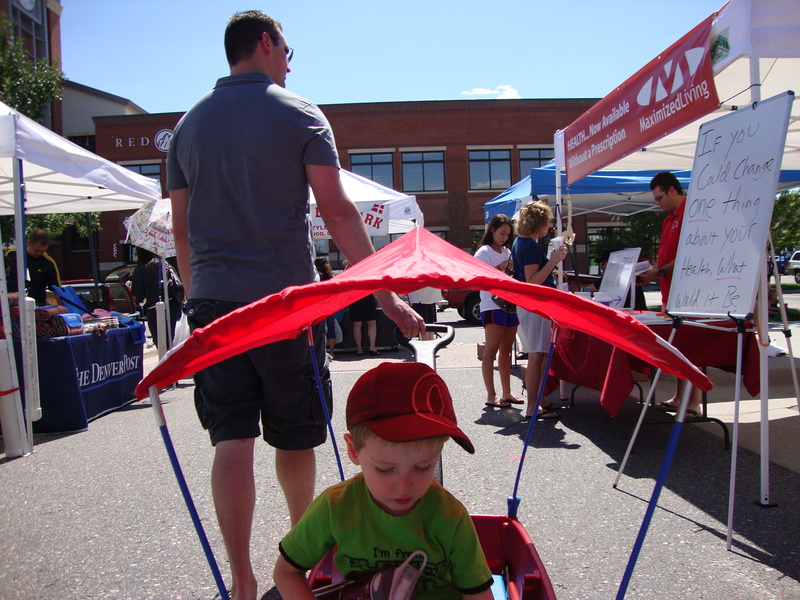 Riding in his covered wagon at the Farmer’s Market, Dad pulling the wagon. 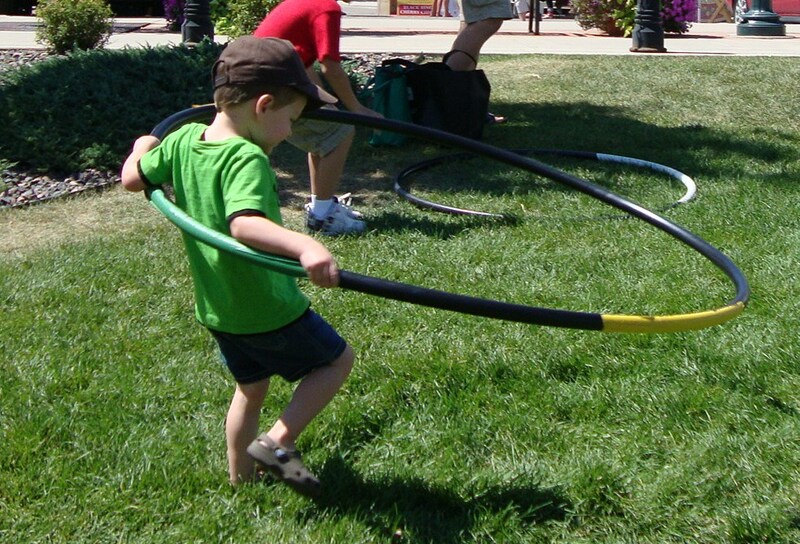 Trying to make a giant hula hoop work by picking it up and running in a circle! Hmmmm? “What’s going on here,” he says. 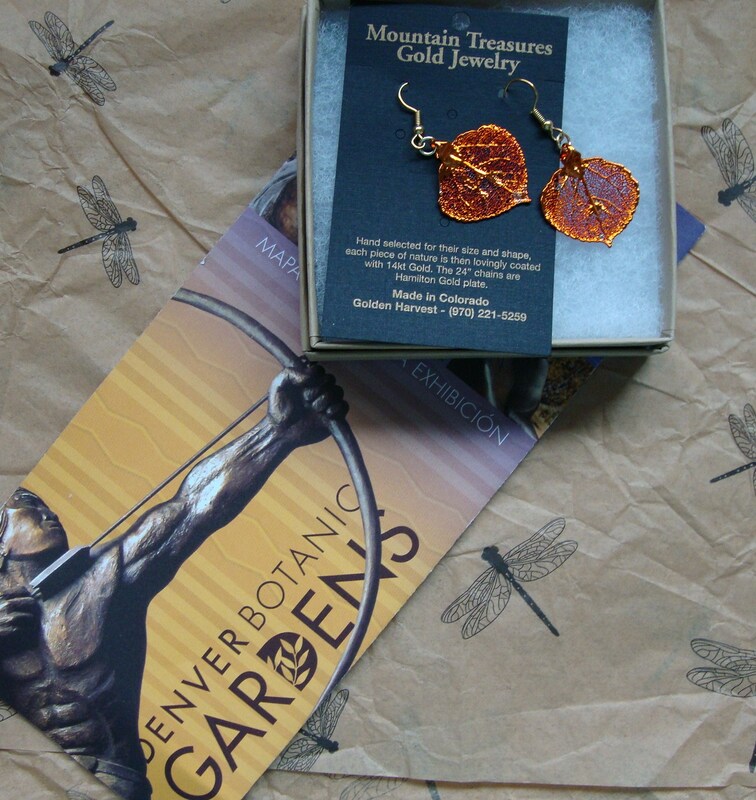 A small treasure for Mairwen Rose, who couldn’t come with us — she just got a new job! Yay for her! A small treasure for me! A rusty, broken, and old, kitchen utensil! Sisters! 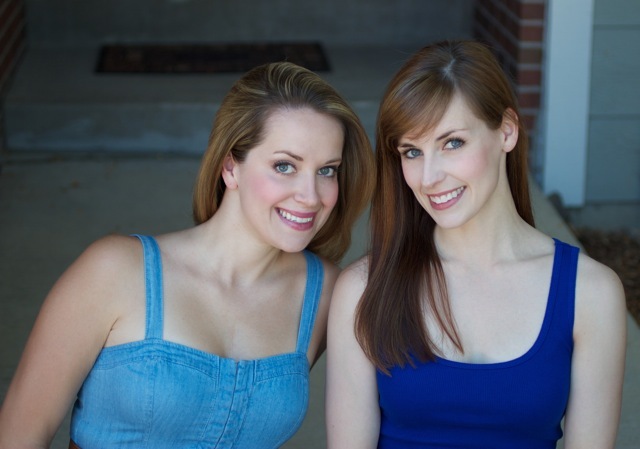 Cait (on the right) and Elizabeth. This was a fun day! It was too hot to stay outside for long, but I found a seed pod(green) from a tree,and it has a green pea seed inside. 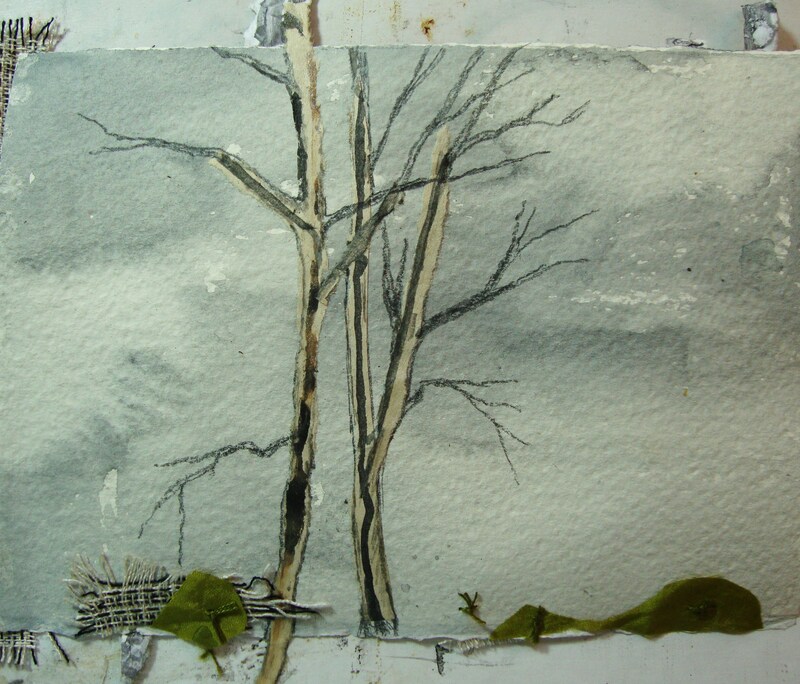 I can’t remember the name of the tree – it was so hot that day my brain was addled! And a little black seed pod from a Hyacinth bean plant! 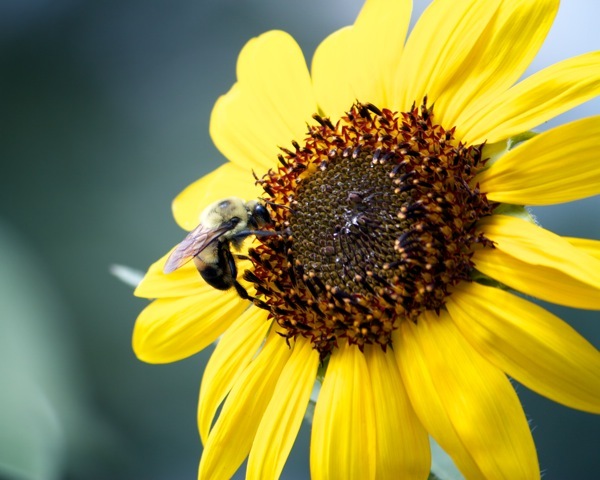 The flowers were so beautiful, I hope I will be able to grow one next summer from this seed! 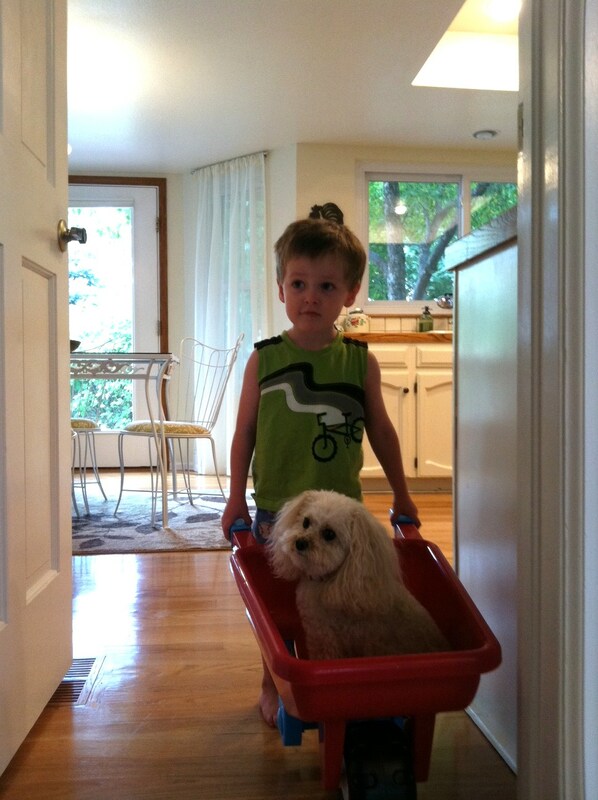 A boy in a wheelbarrow! 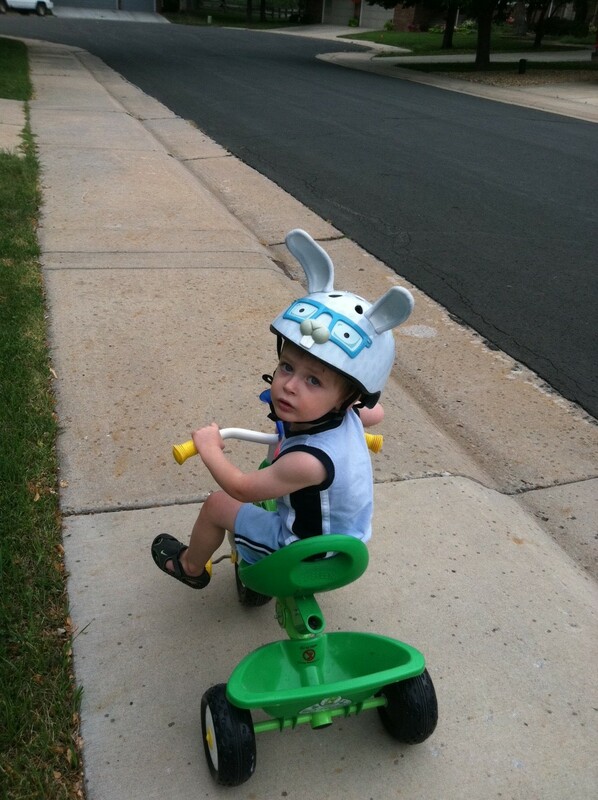 A boy on a tricycle with a funny helmet! Auntie Cait and Cabrin in front of his home. 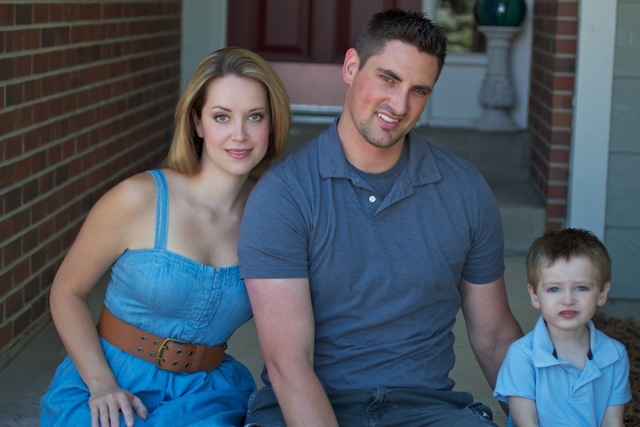 Elizabeth and Christian (my son-in-law)and Cabrin (making a silly face). 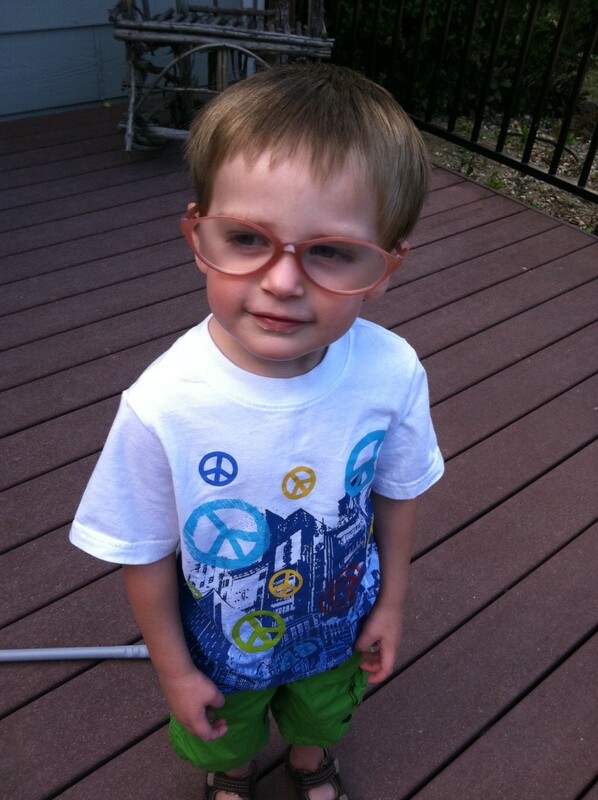 Wearing “Mimi’s” glasses and looking a little unfocused! Wearing my glasses again! He says, I see two Mimis! 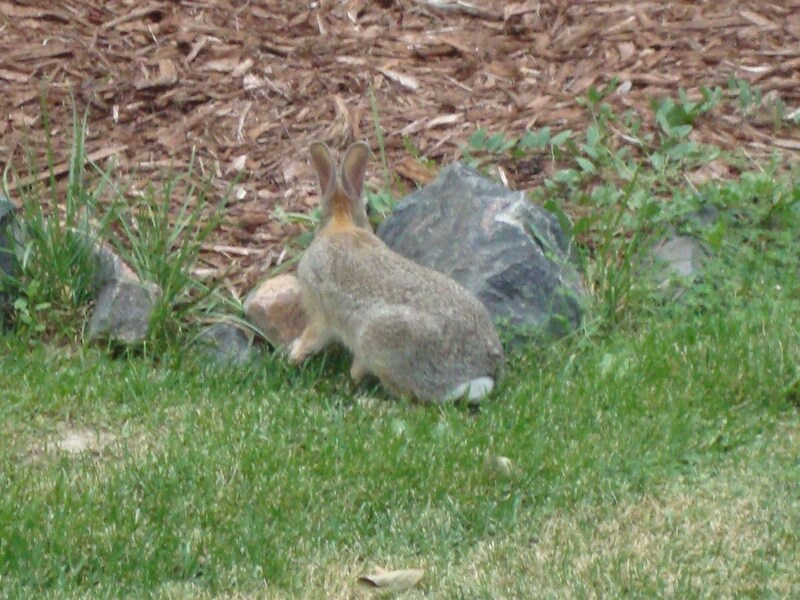 A little wild bunny in the back yard. Denver was a lot of fun, but time to get back into the studio and make some art. 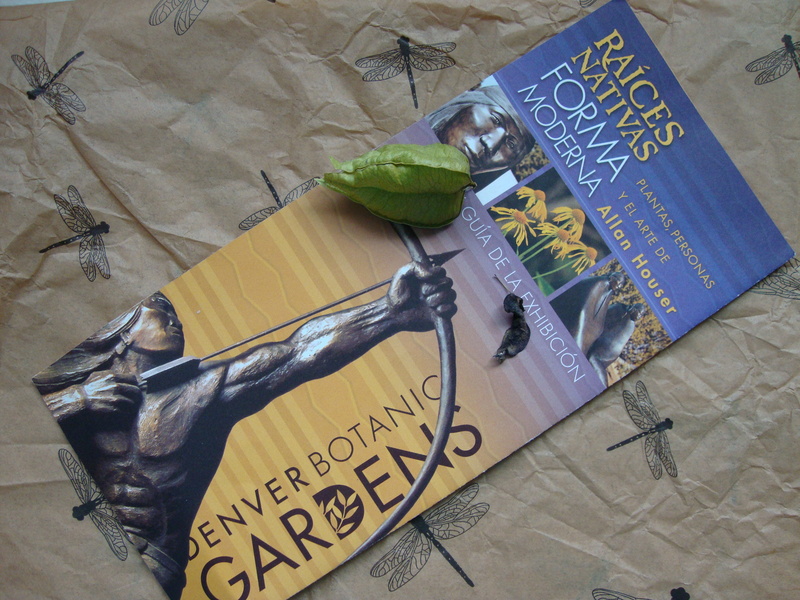 My first project is to put together my travels in Denver book for 2011!